The expedition rooster wakes us up a bit earler than normally. 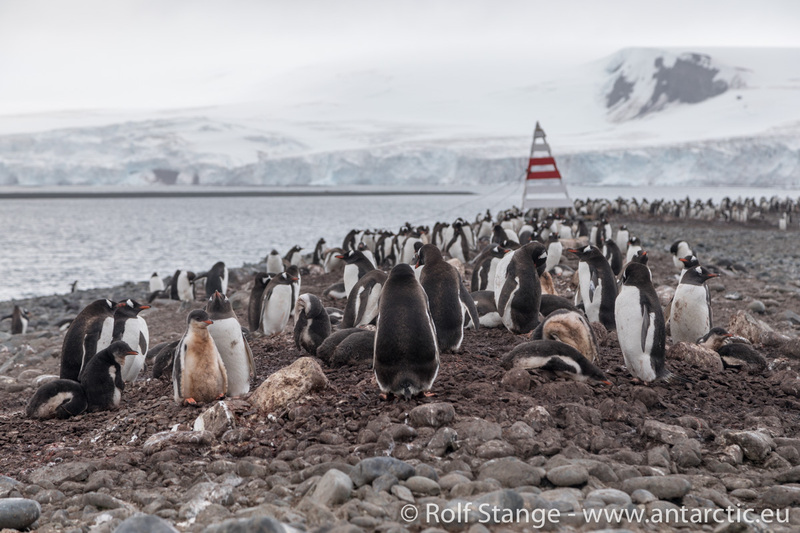 The weather forecast for the Drake-Passage suggests an early departure, but we do not want to miss the opportunity to step on antarctic ground one more time and to say goodbye in a proper way. 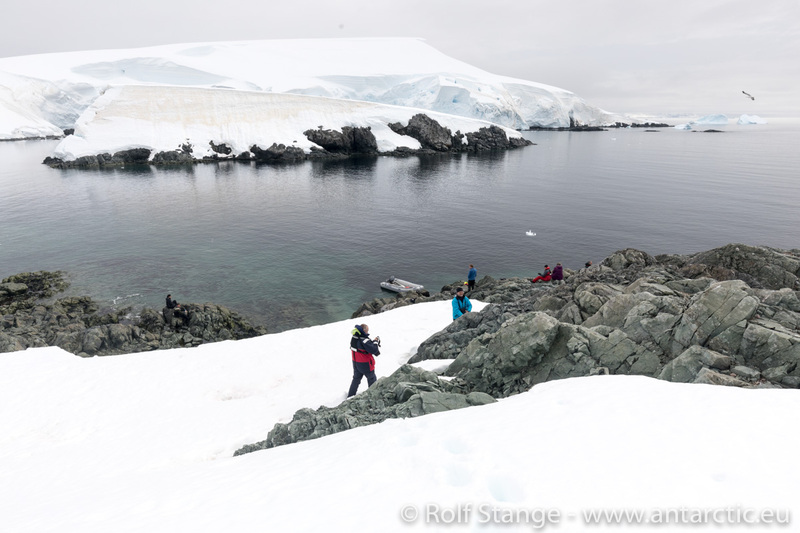 After a little stroll up a snow field, we settle down on some rocky hills, enjoying fantastic views of the Melchior Islands: small, ice-covered islands with narrow sounds, surrounded by the wide-open Dallmann Bay. 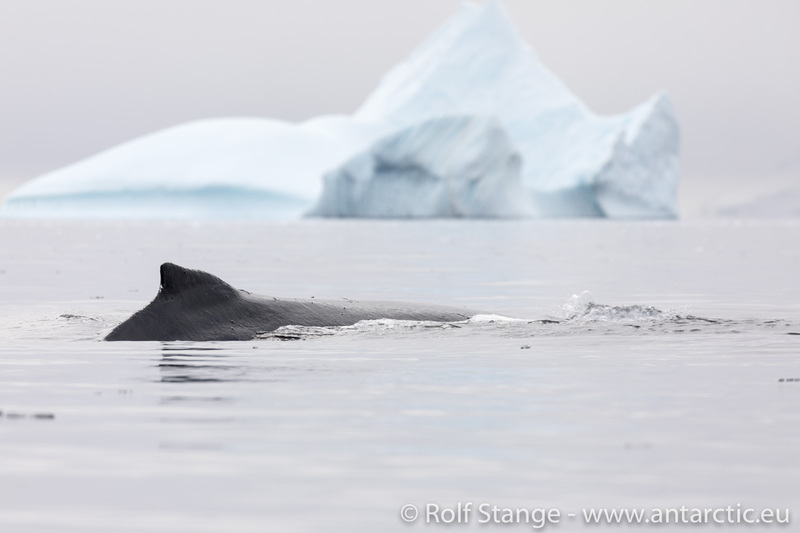 Icebergs are drifting here and there, and a whale is blowing in the distance. 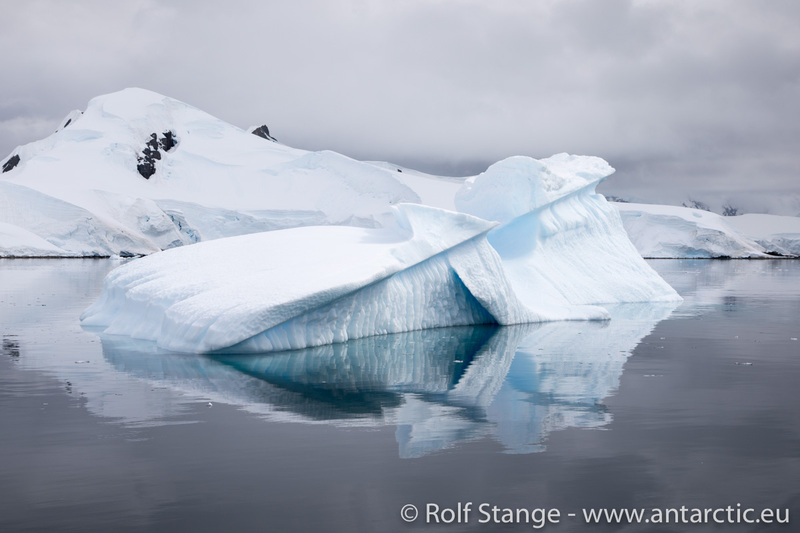 A moment of antarctic paradise. Then the moment has come. 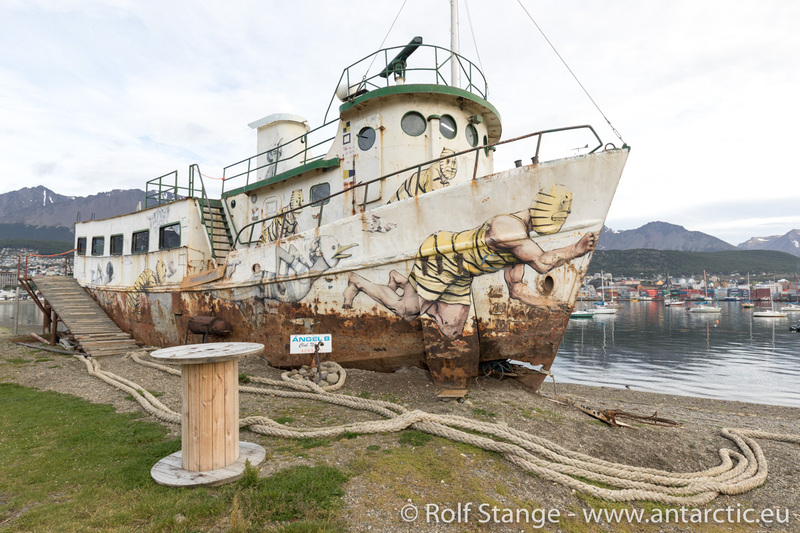 The dingies are stowed away and the ship is made ready for the open sea. 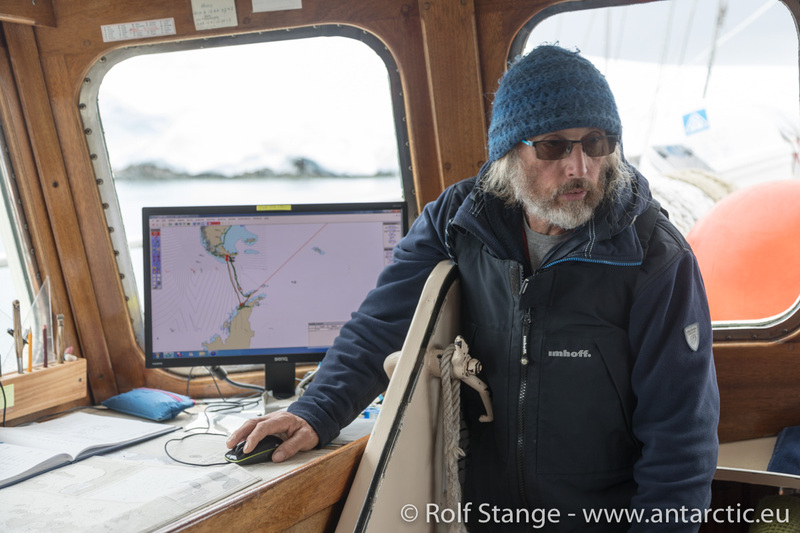 The anker is going up, and skipper Heinz is steering the ship out between the islands and into Dallmann Bay, the open sea just ahead of us. 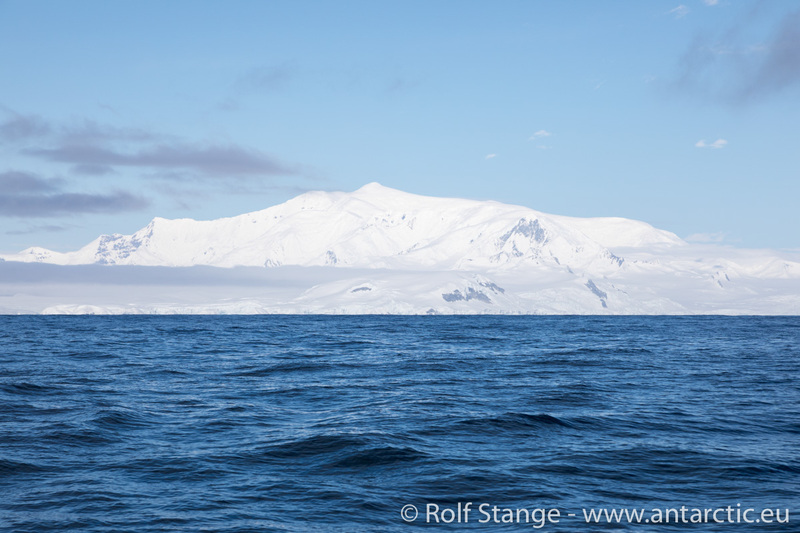 The sun is shining, there is almost no wind, just a moderate swell that reminds us that this is not a lake. 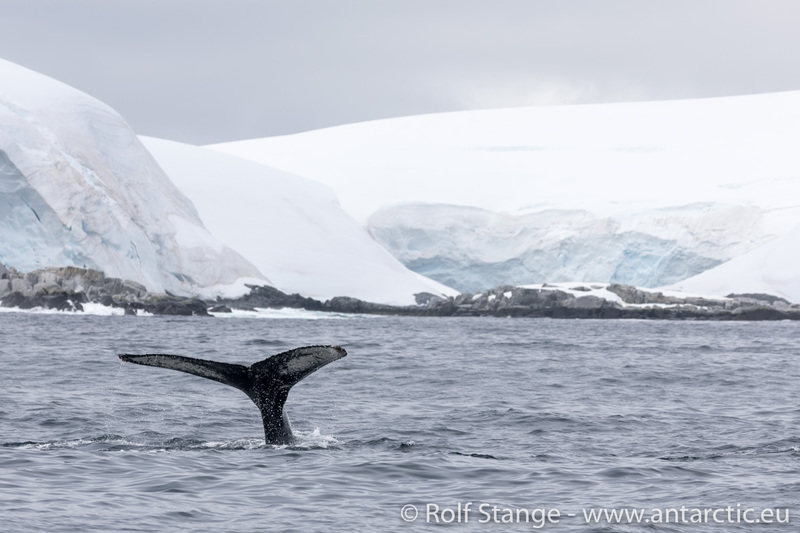 Wide ice caps are shimmering in the sun behind us, and some Humpback whales come close to wave us goodbye with their flukes. 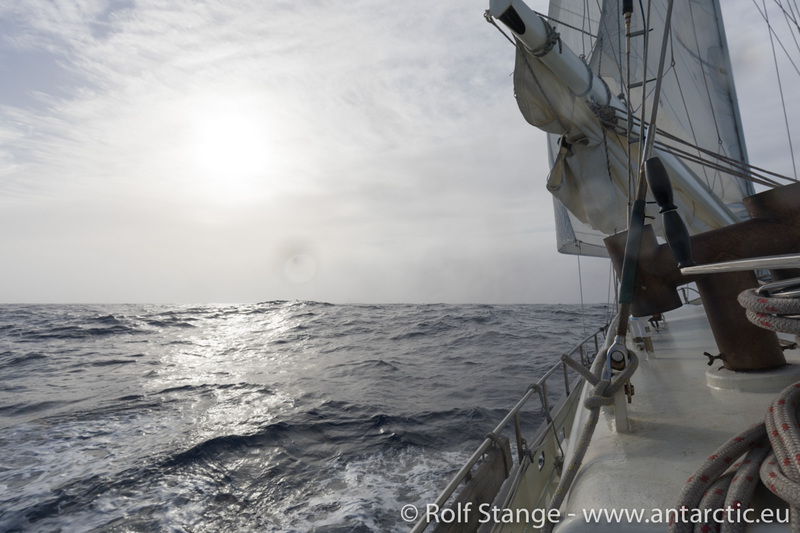 We have got a good 500 nautical miles between us and Cape Hoorn. 29/30 January 2018 – Nothing at all happens on Monday. 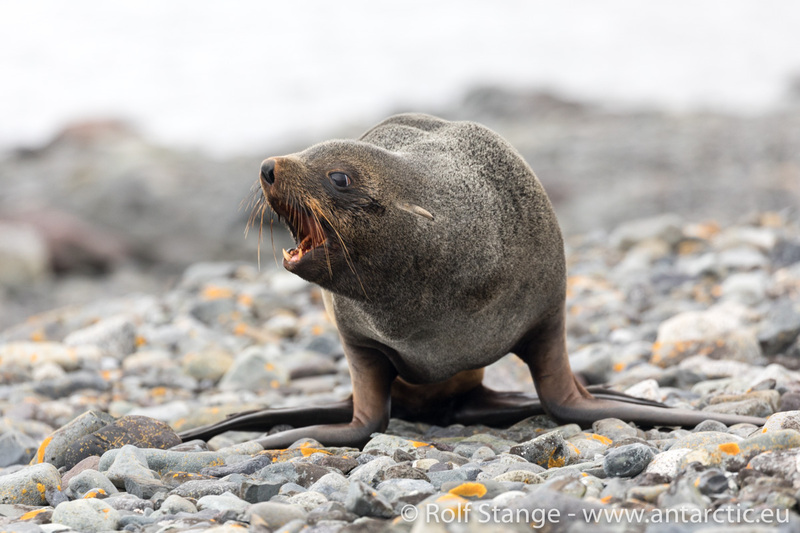 Wind, wind, wind. 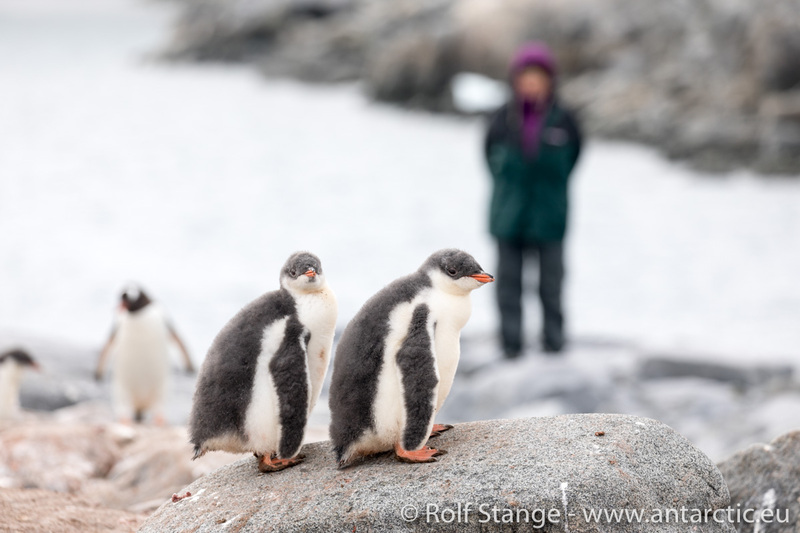 No chance to get to the real penguins which are just a few hundred metres away, so at least we talk about them in theory. But this we do extensively. 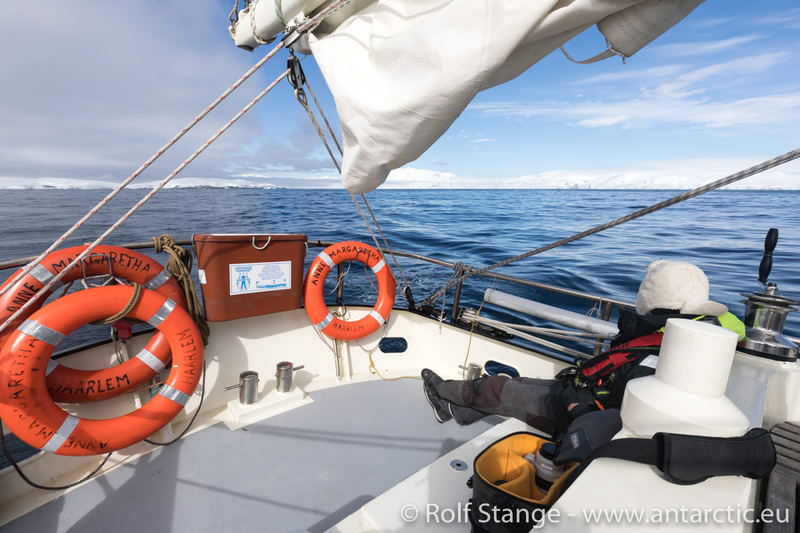 A relaxed day on board. Not what we had planned, but things could definitely be worse. 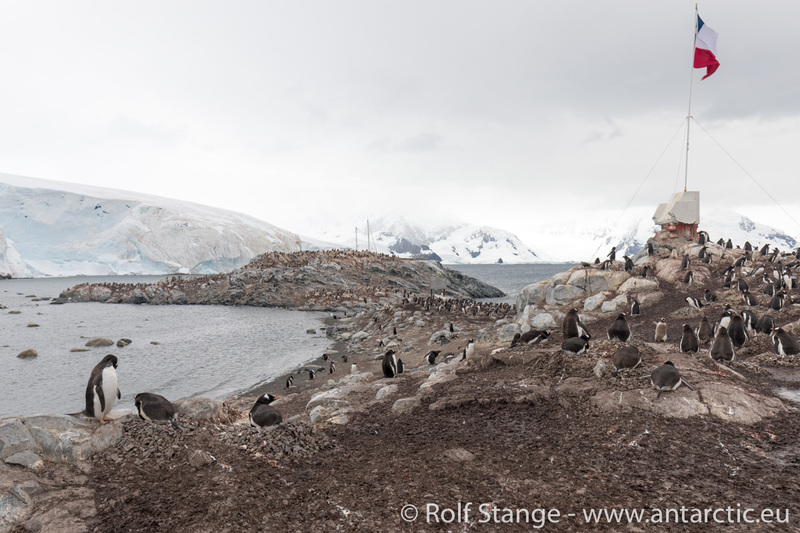 Life in the Antarctic. 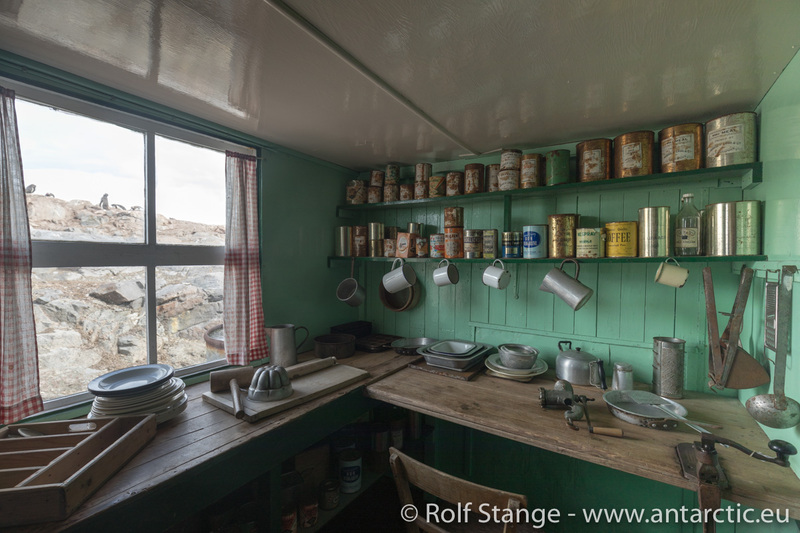 A 360° panorama tour of Port Lockroy from a previous Antarctic trip. 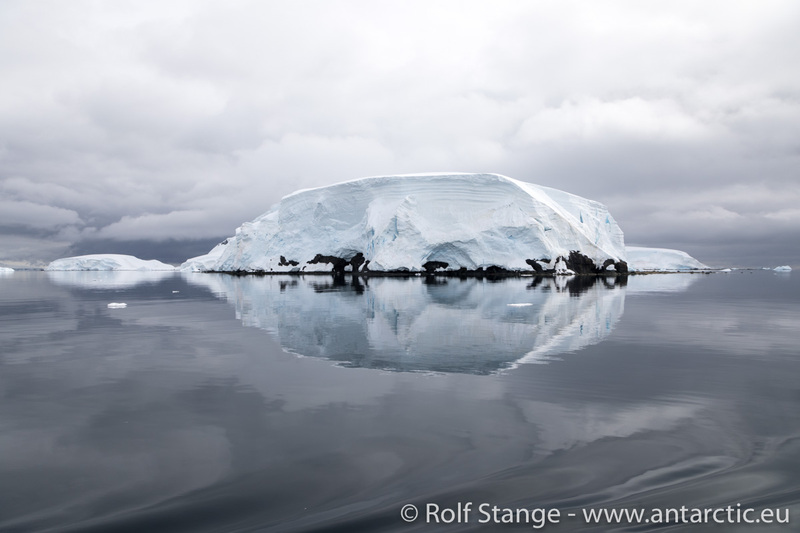 This is followed by the passage of the Neumayer Channel, a dream of wild antarctic scenery with mirror images on the water. 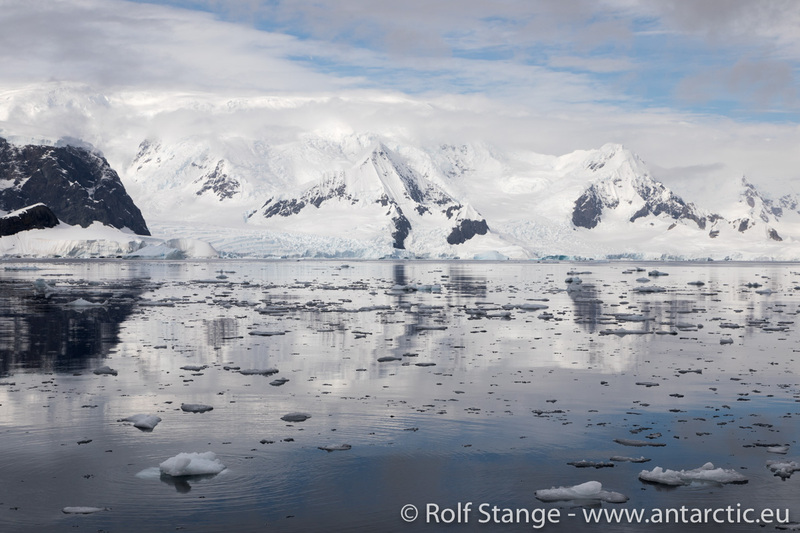 Later, the evening sun adds even more favour to the whole scene as we turn from Gerlache Strait into Dallmann Bay. Something that we, nevertheless, do with some sadness. 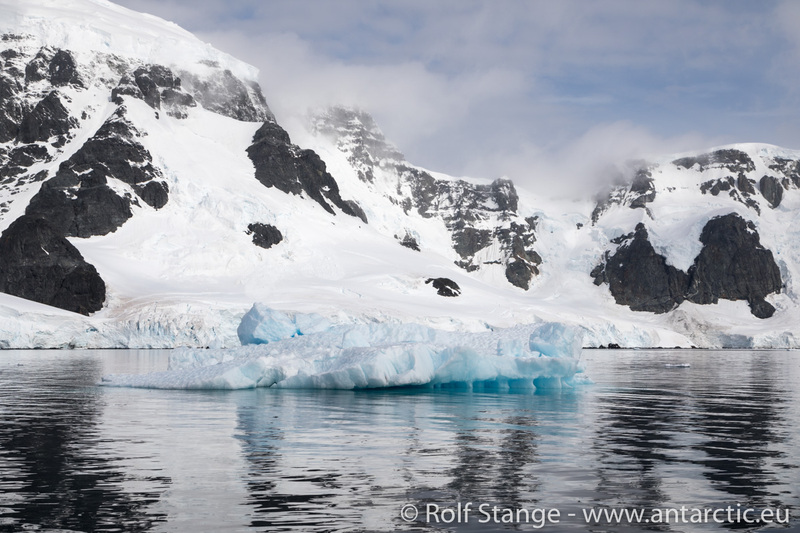 It means that we will leave Antarctica tomorrow. 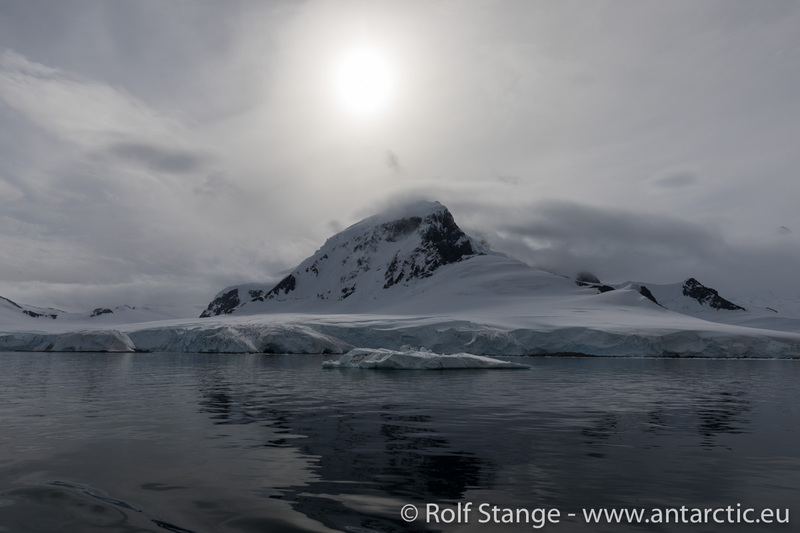 But we have still got the Melchior Islands ahead of us, to anchor there tonight and to say farewell to Antarctica tomorrow. 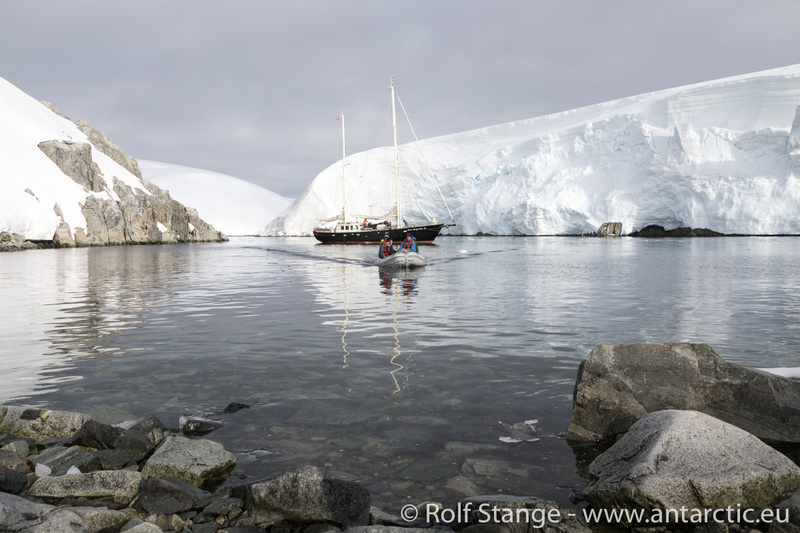 Sailing into Paradise Harbour is a slightly monochrome dream of land and sea, mountains and glaciers, icebergs and islands. 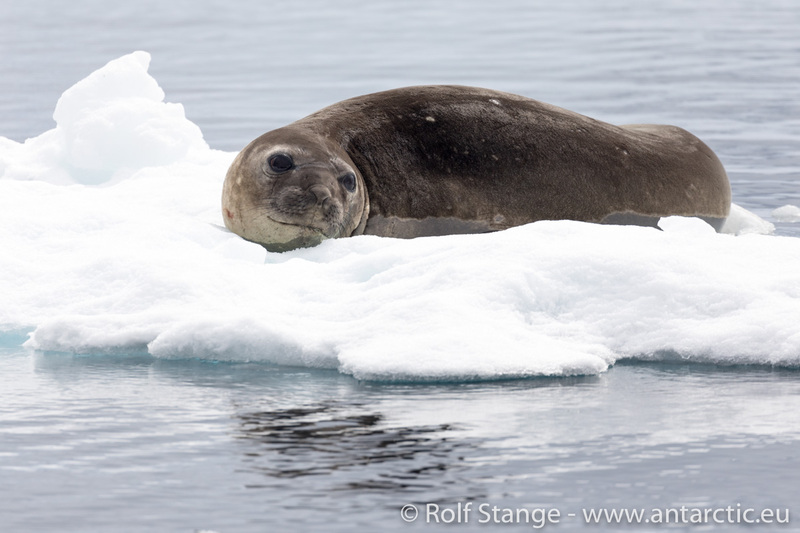 Everywhere seals on the ice. 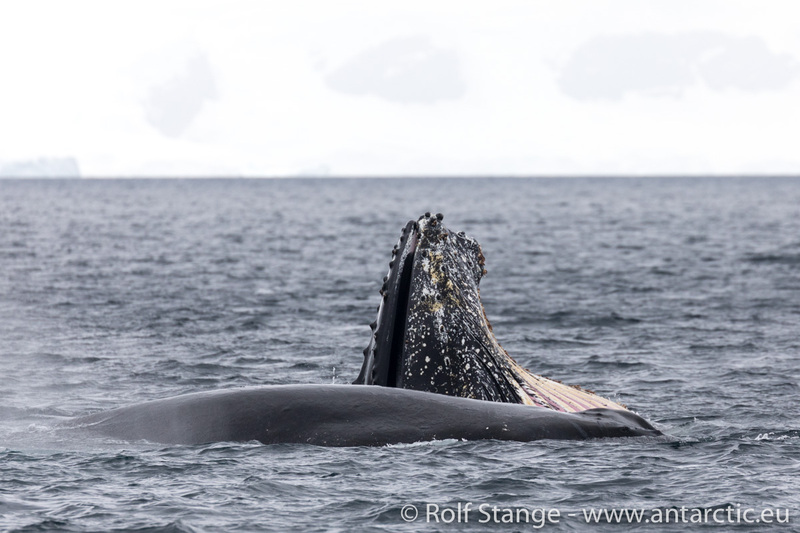 Some whales here and there. 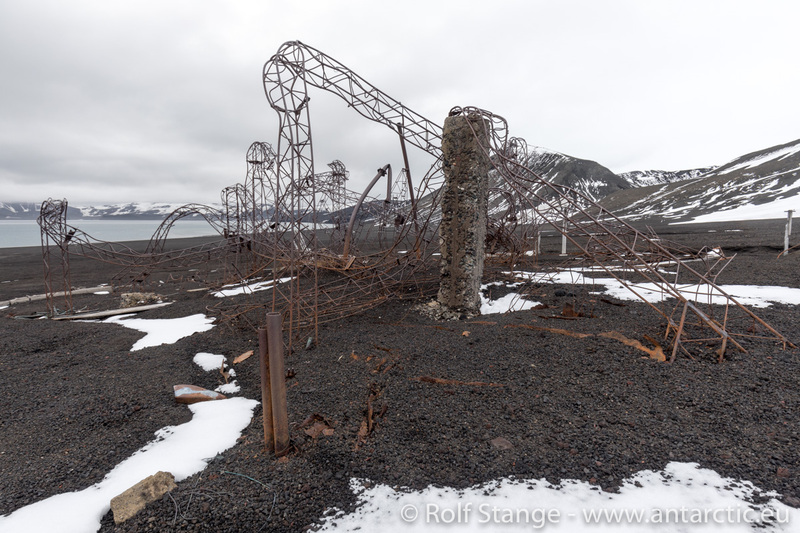 The whalers gave Paradise Harbour its name for a good reason. 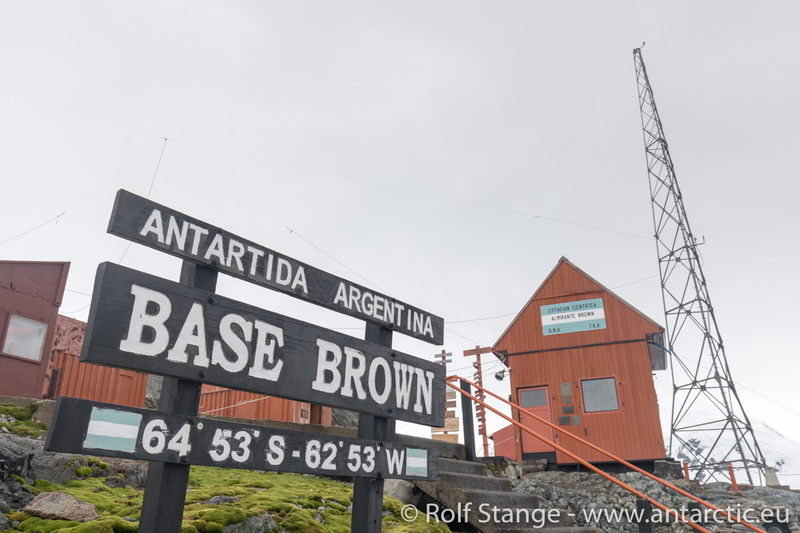 The Argentine station Almirante Brown was built in 1951 but only sporadically used after a fire in 1984. 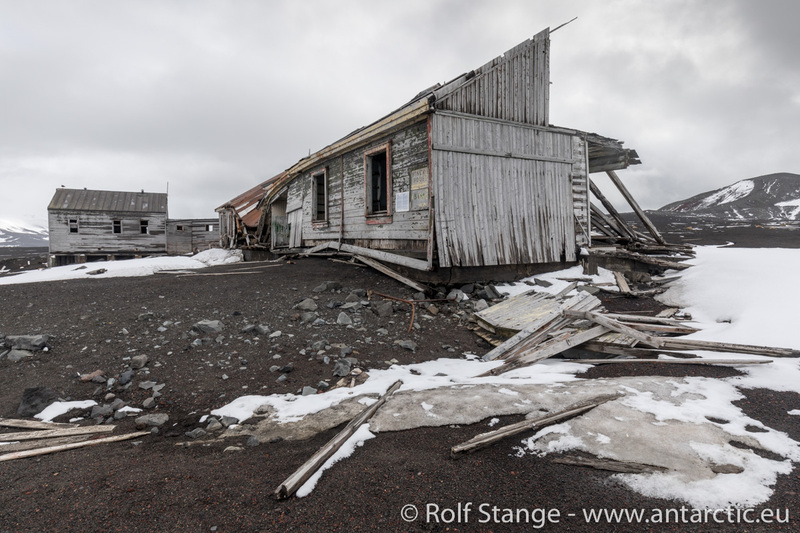 There is now a team there and the plan is to renovate it completely for potential year-round use in the future. Well, we’ll see. 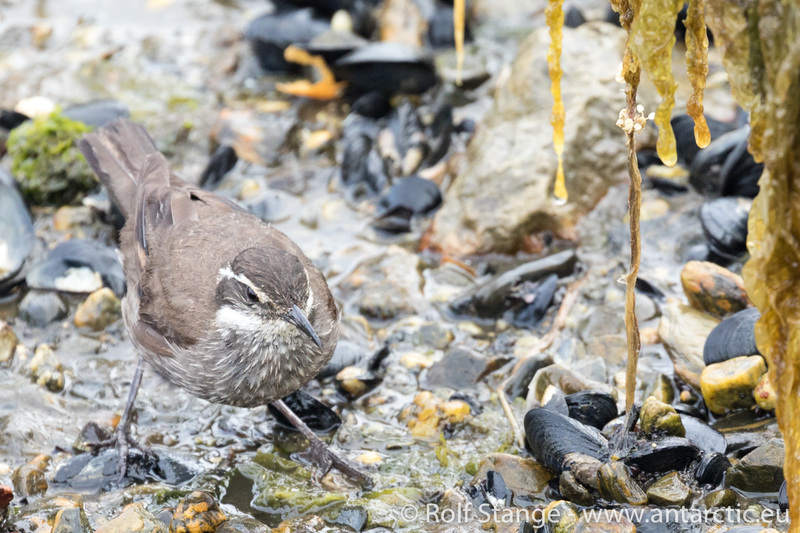 What is more important to us now is that we get an invitation for an spontaneous visit, something that is going hard over my very rudimentary knowledge of Spanish language. But we make it work and it is fun. 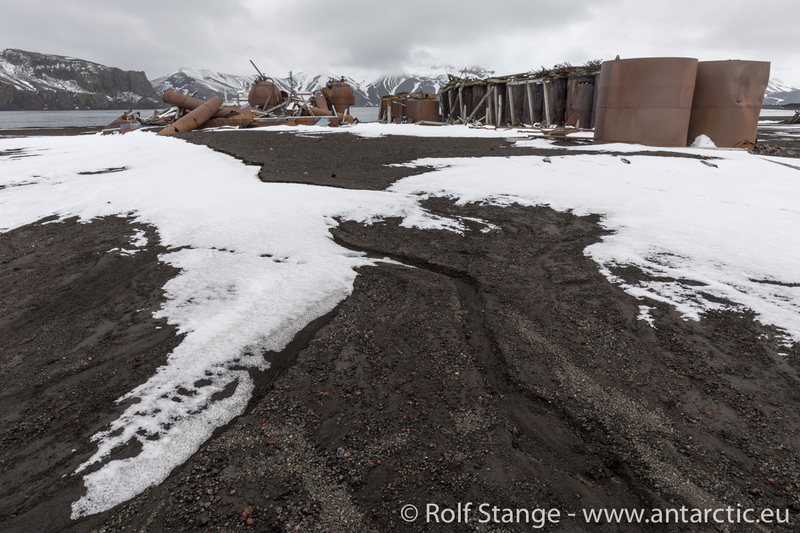 The highlight is, of course, the panoramic view from the hill behind the station and the famous slide down afterwards. 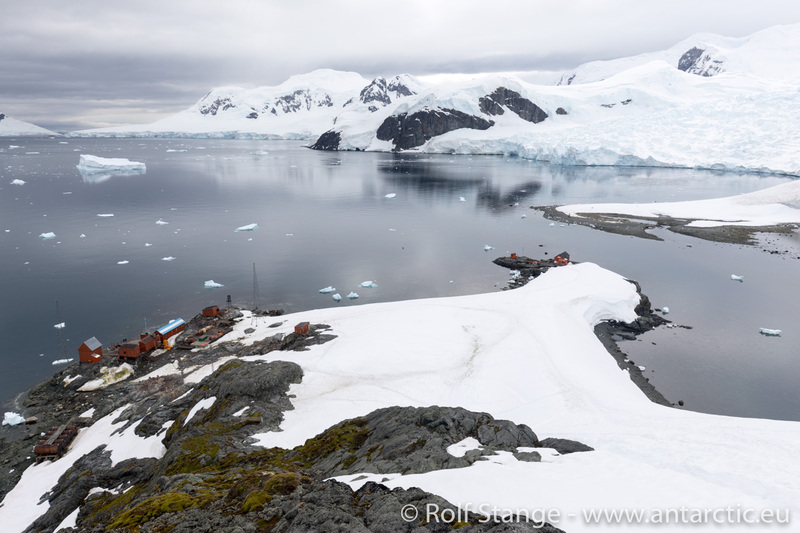 Click here for the panoramic views of Paradies Bay from a previous Antarctic Tour. 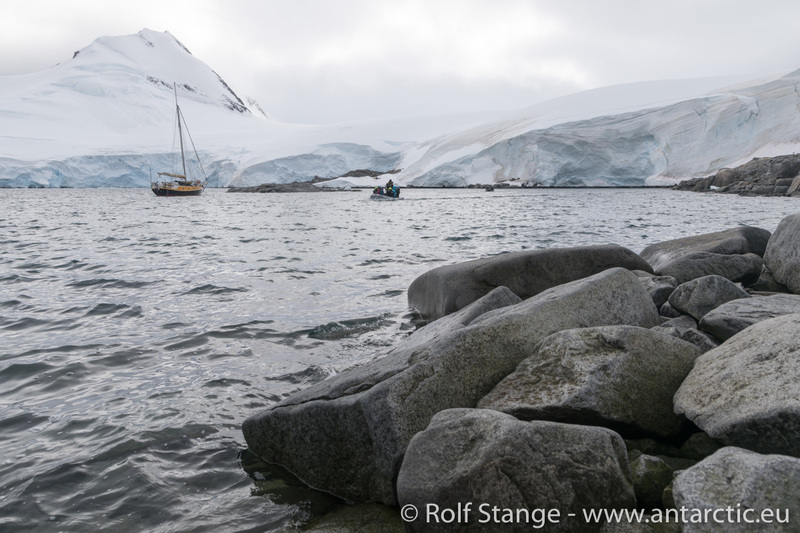 Our prospected anchorage just around the corner is already occupied, and there is really just space for one boat there. 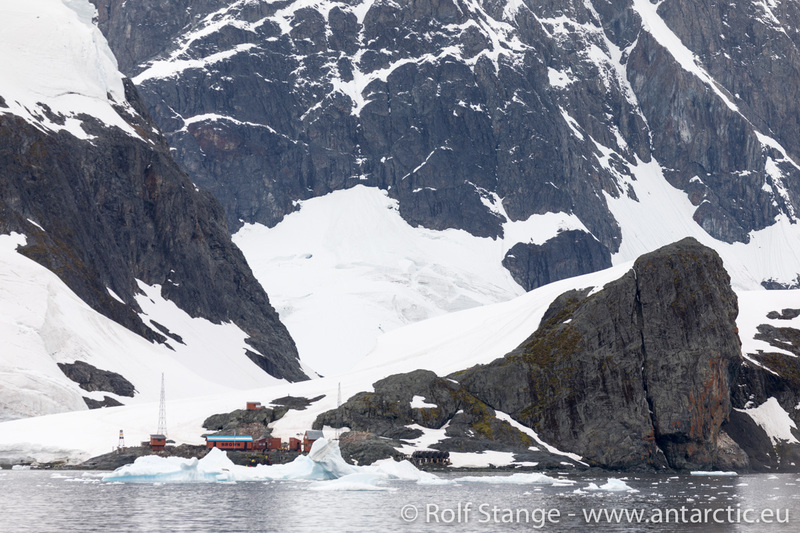 So we set course for Port Lockroy, which takes a good couple of hours. 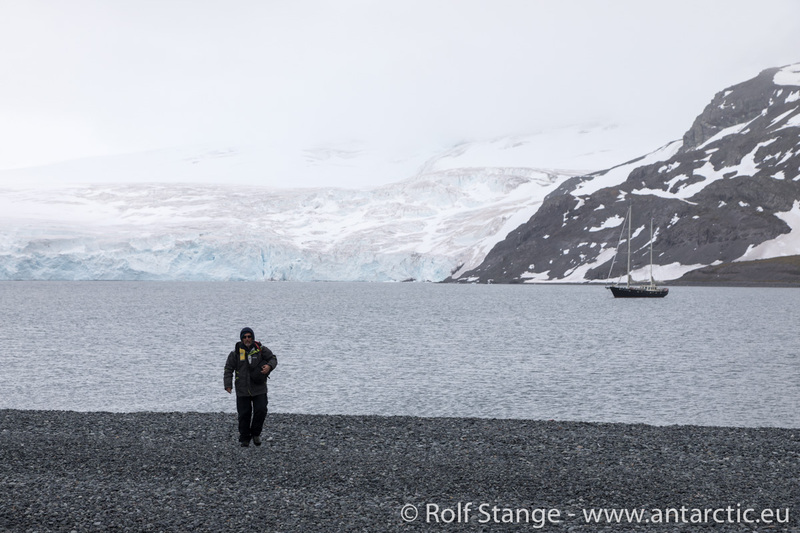 It becomes quite windy as we start crossing the Gerlache Strait. 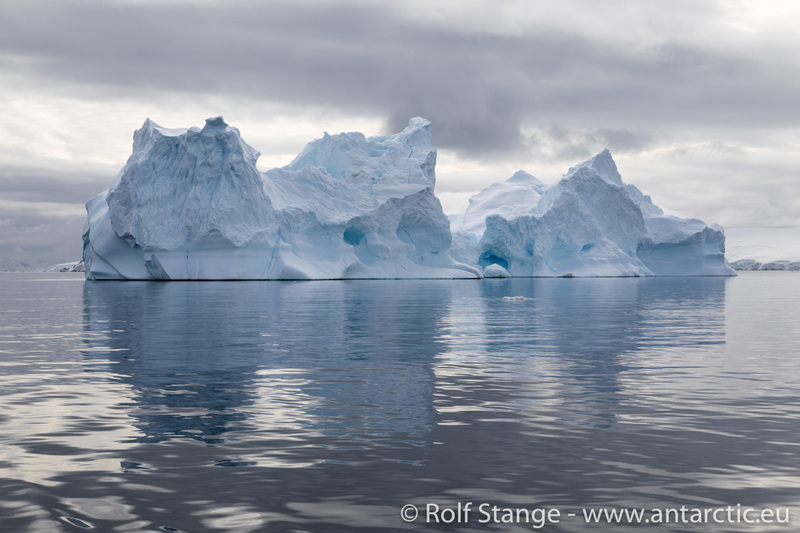 We turn into Peltier Channel, which is avoided by larger ships as it has some shallows. 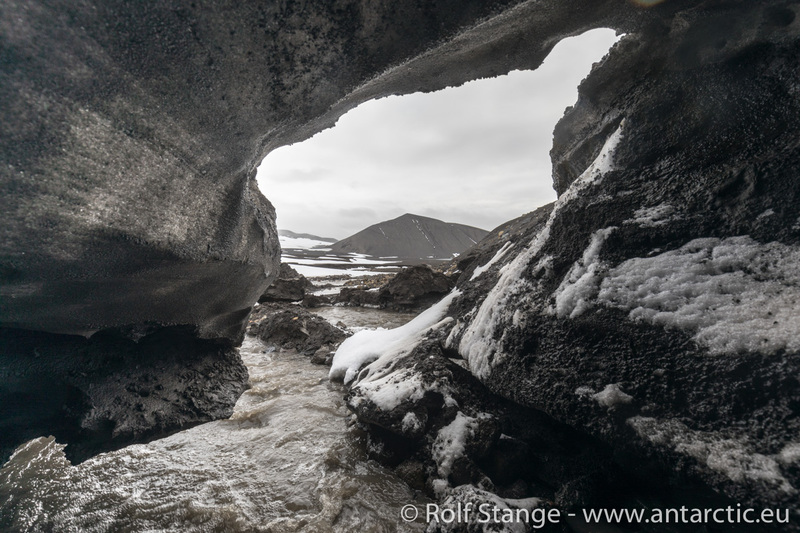 A spectacular passage! And icy cold in the wind. 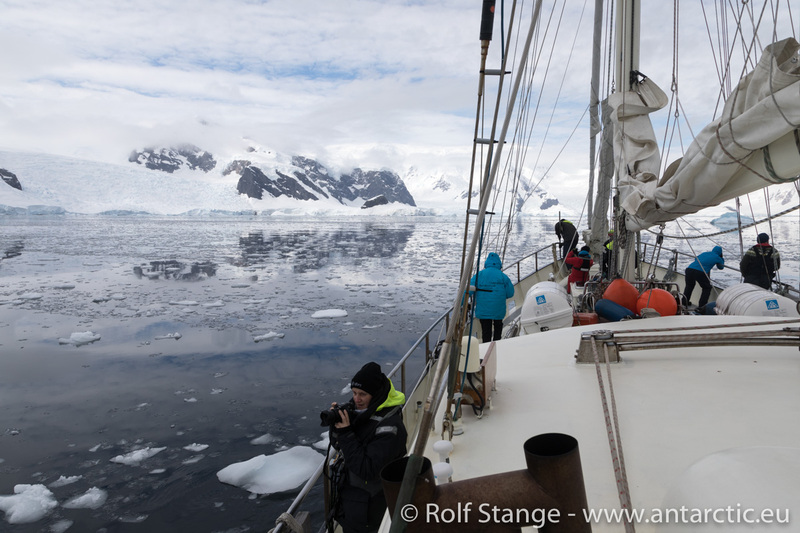 Some brave souls spend the whole passage of Peltier Channel outside on deck. 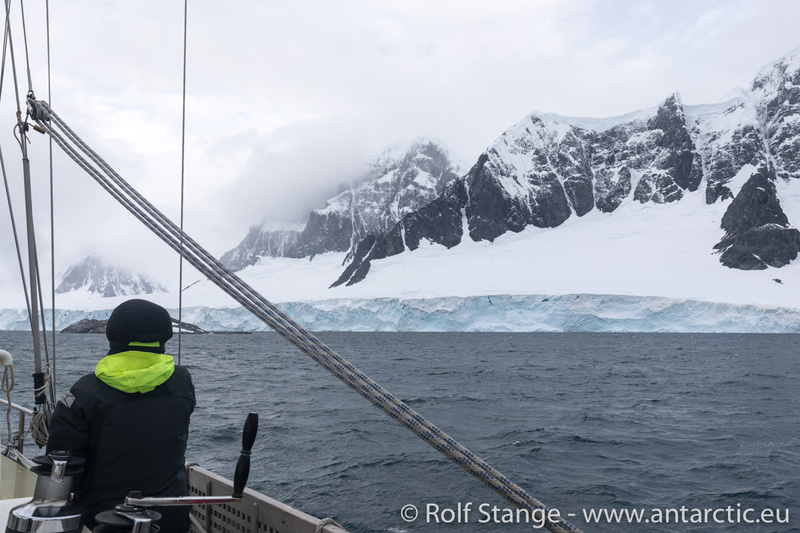 There is a strong breeze at Port Lockroy and lots of bits and pieces of glacier ice are drifting around, but it is sheltered from waves and there is good holding ground for the anchor, and that’s all we need for tonight. 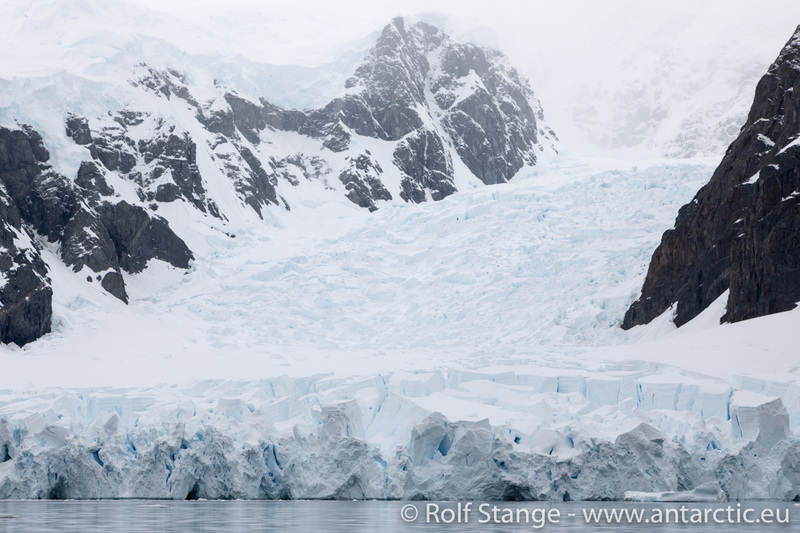 Later in Gerlache Strait, it is quite windy, and Errera Channel is not the world’s best place today either. 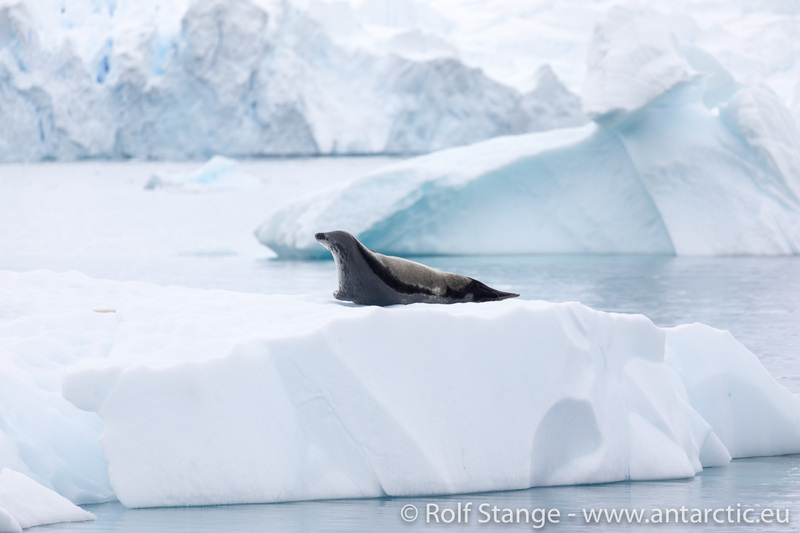 There are many Crabeater seals resting on ice floes, and once, a rare Snow petrels flies past the ship. 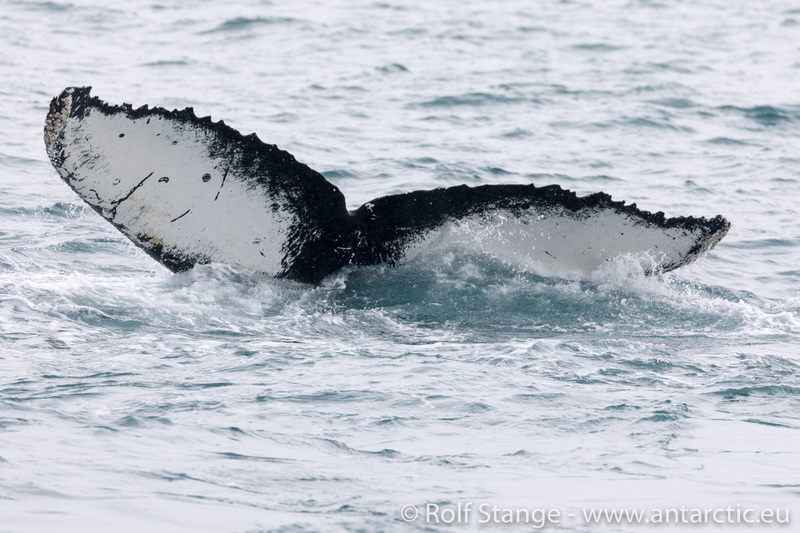 More flukes of more Humpback whales. 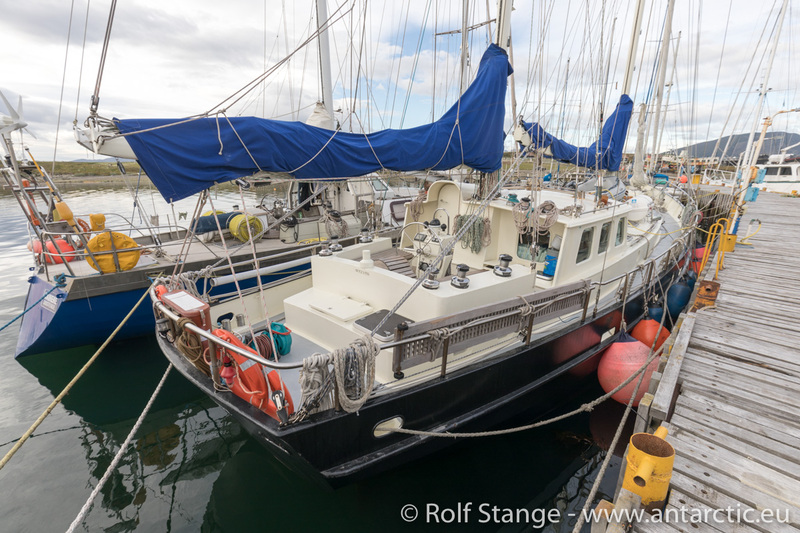 We drop anchor at Waterboat Point at the northern entrance to Paradise Harbour („Bay“), with additional shore lines so we should have a stable position for a good and calm night here. 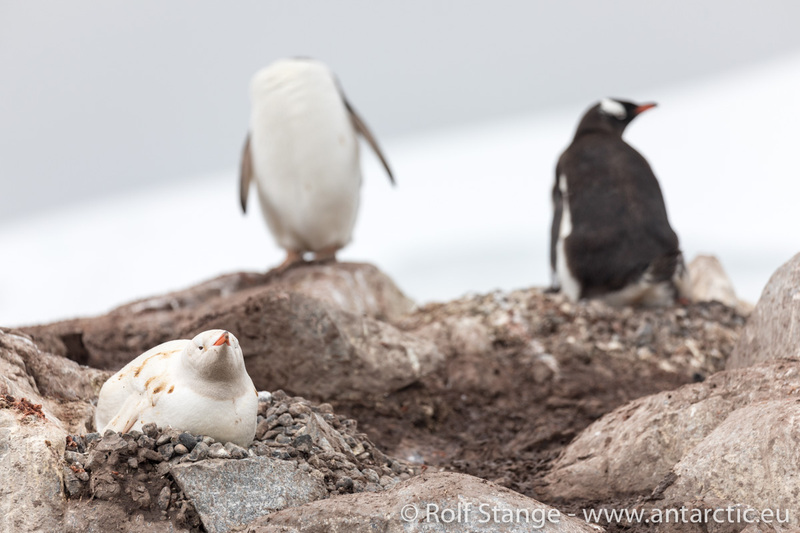 And we have a chance to visit Waterboat Point with its Chilean station and the Gentoo penguin colony where we see one of the famous leucistic penguins (they are mostly white, but they do have some pigment so they are no albinos). 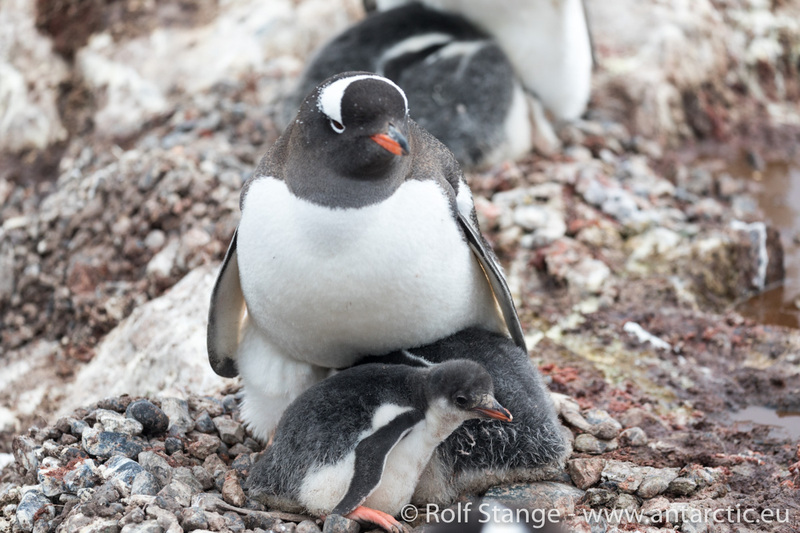 The chicks are still much smaller than in the South Shetland Islands further north. 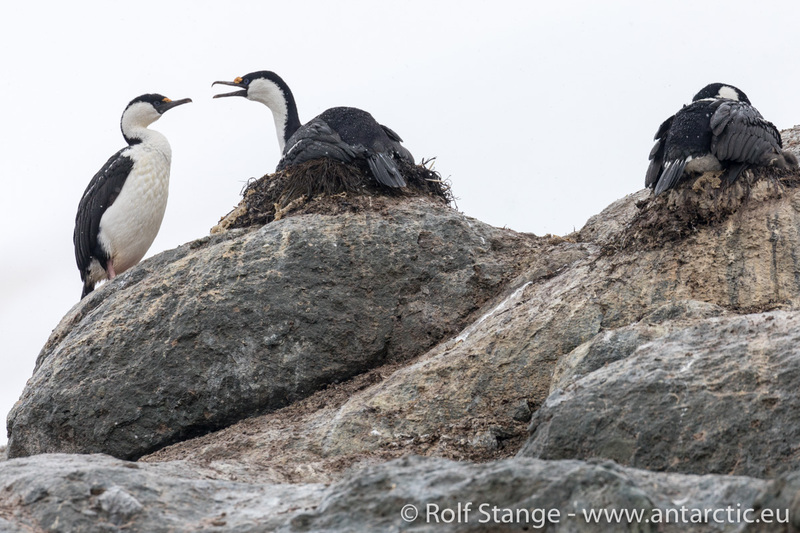 Here, they are mostly still together with one parent on the nest. 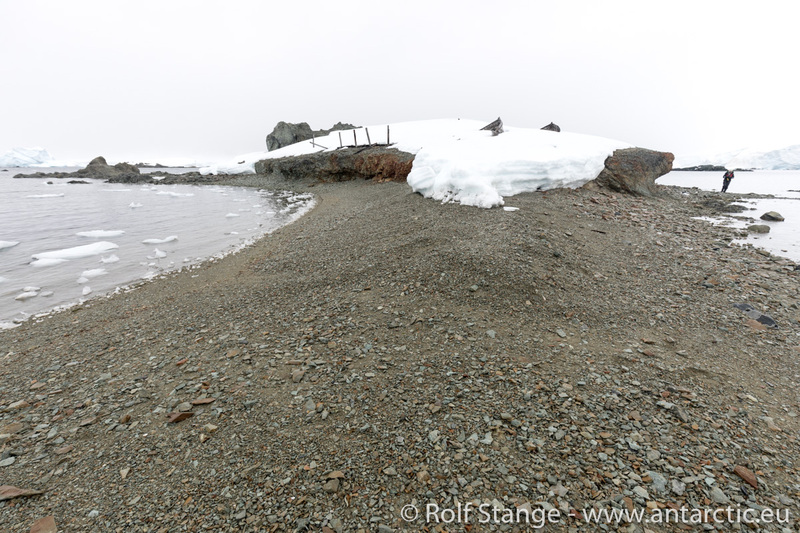 There was a remarkable adventure at Waterboat Point when two young British men wintered here in 1922. 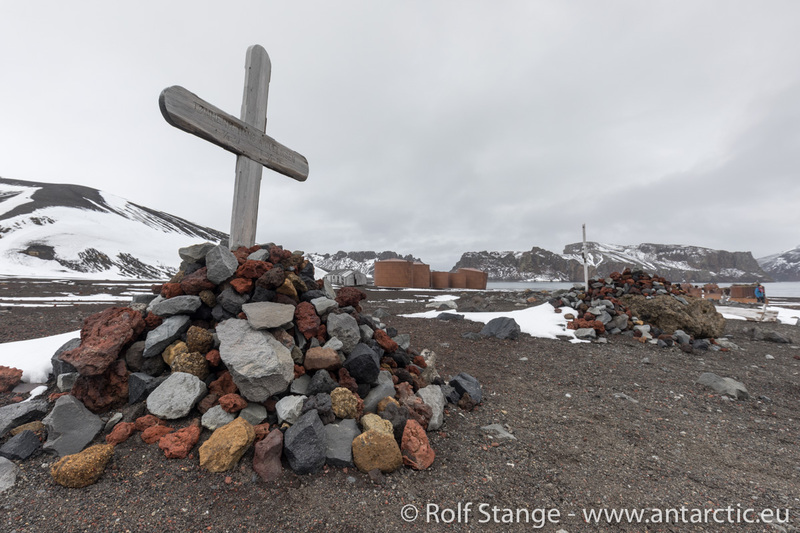 They were not marooned after a ship wreckage or so, it was they decision to stay here although conditions for their expedition were anything but ideal. 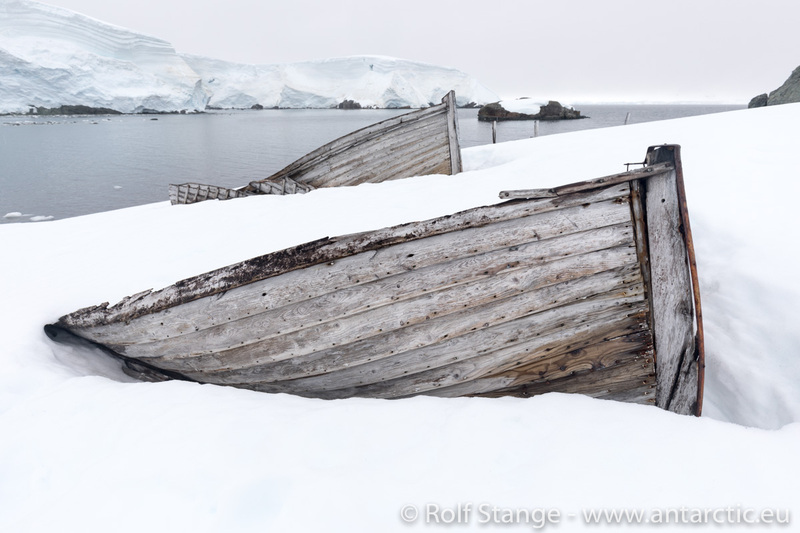 Everybody knows Shackleton and Scott, but hands up – who knows Bagshawe and Lester? Well, maybe not quite the same league of explorers, but still, a great story of bravery worth remembering. The idea was to spend a full day at Enterprise Island. 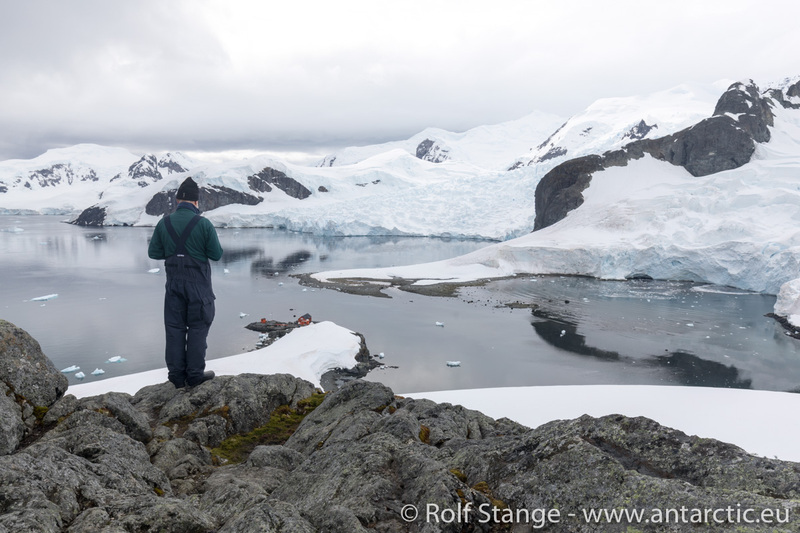 Making a nice excursion and finding some antarctic quietness and solitude. 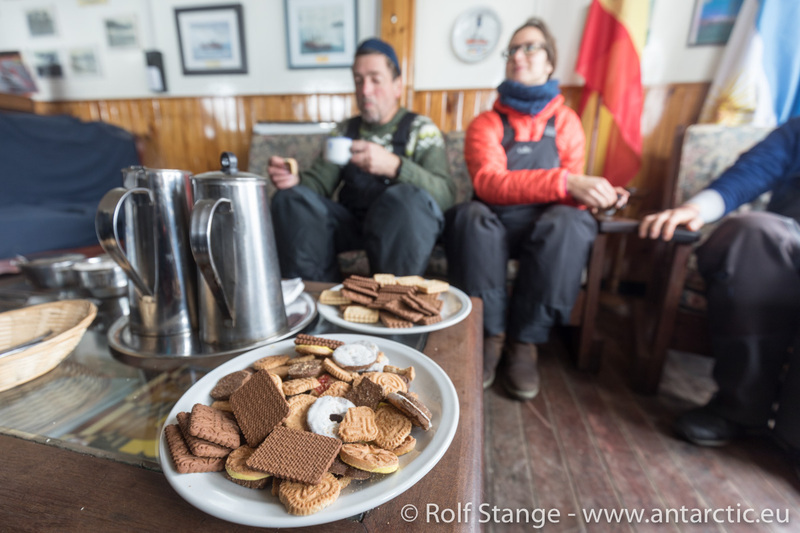 Initially, it appeared to be quite grey outside, so we made a relaxed start in the morning, but then we went out with the dingies. 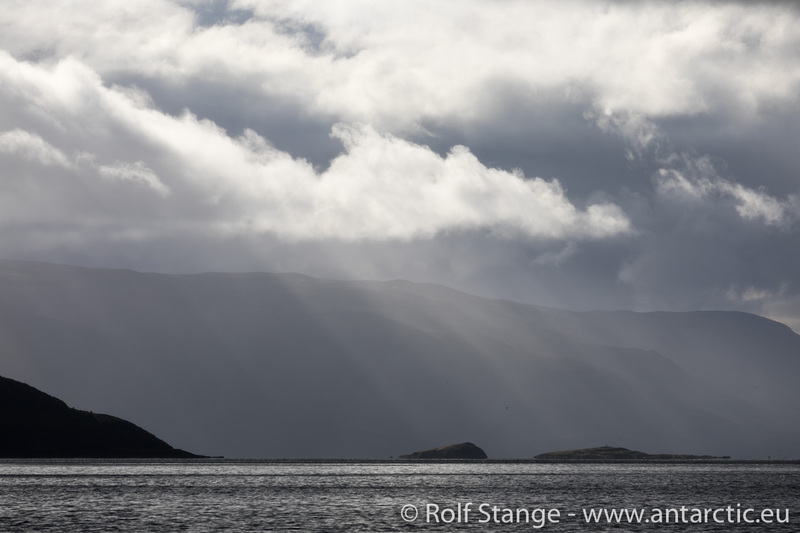 Wilhelminay Bay was flat as at table cloth, the clouds became thinner and thinner and the sun was warming us noticeably. 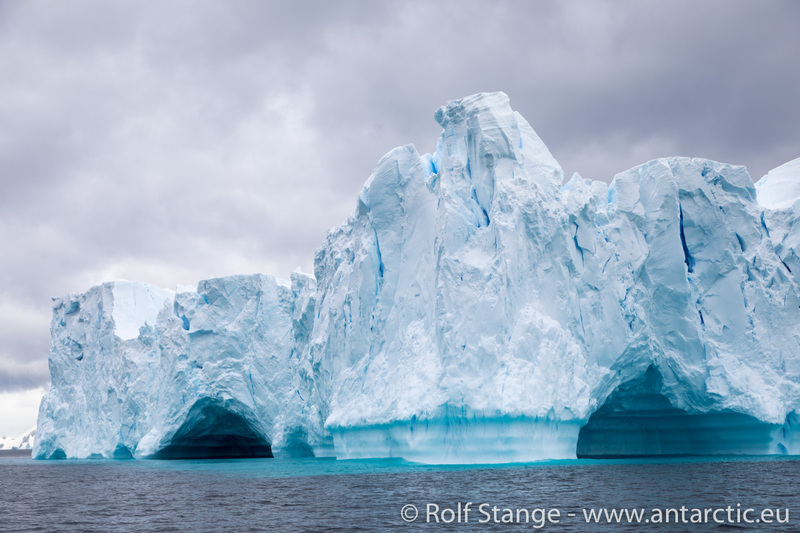 So we spent quite a while drifting near a big iceberg and enjoying life in the Antarctic. 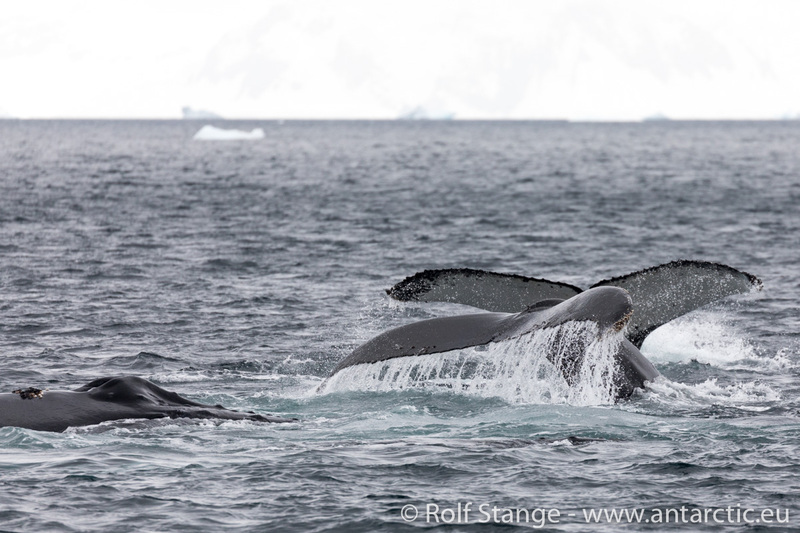 After a while, we spotted three Humpback whales a bit further north. Actually, it was a good bit, but we gave it a try anyway. 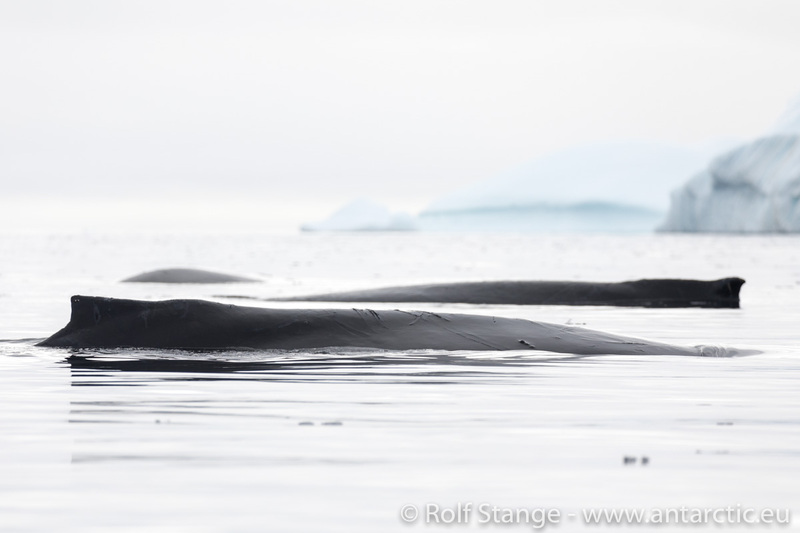 After a while, we got close to them and as it turned out they were now in deep sleep mode, just hanging under the surface, occasionally surfacing to take a good, noisy breath. 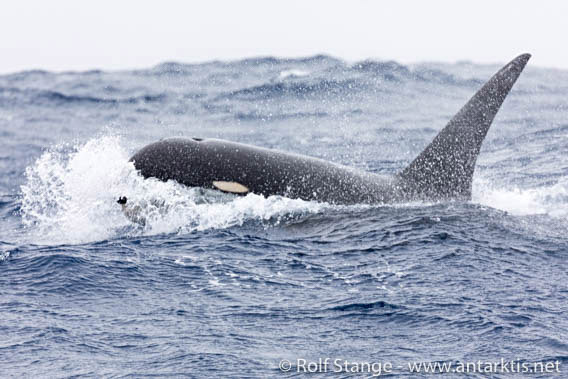 Again, we spent a long time drifting quietly, enjoying the presence of these three great creatures, until we said goodbye to them. 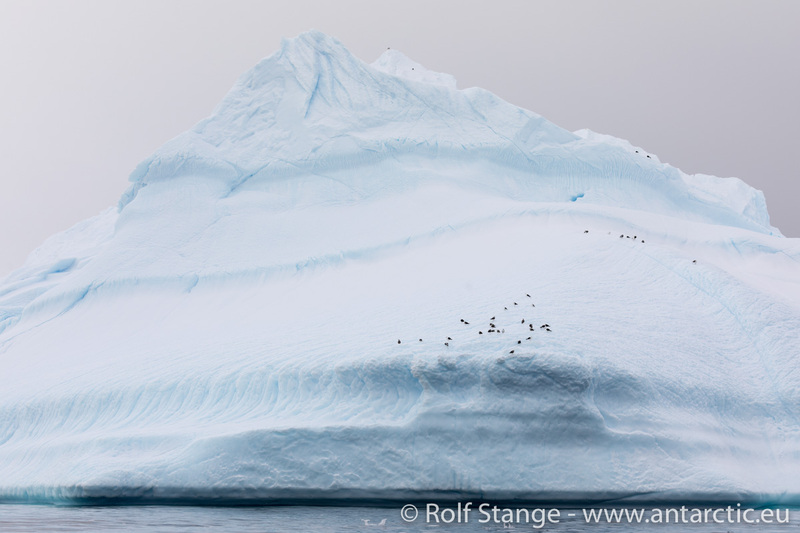 A little piece of polar heaven. 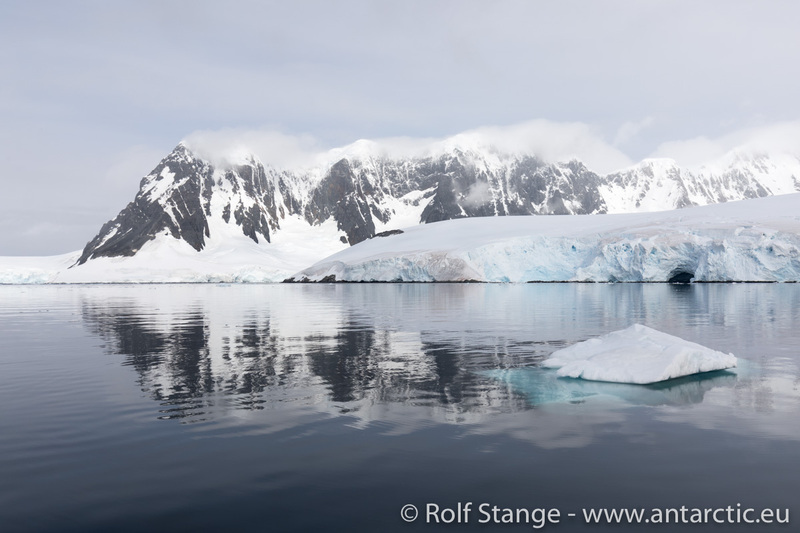 Shortly before we reached our good home again, the Anne-Margaretha, we passed by a little island and we just decided to go for little landing. 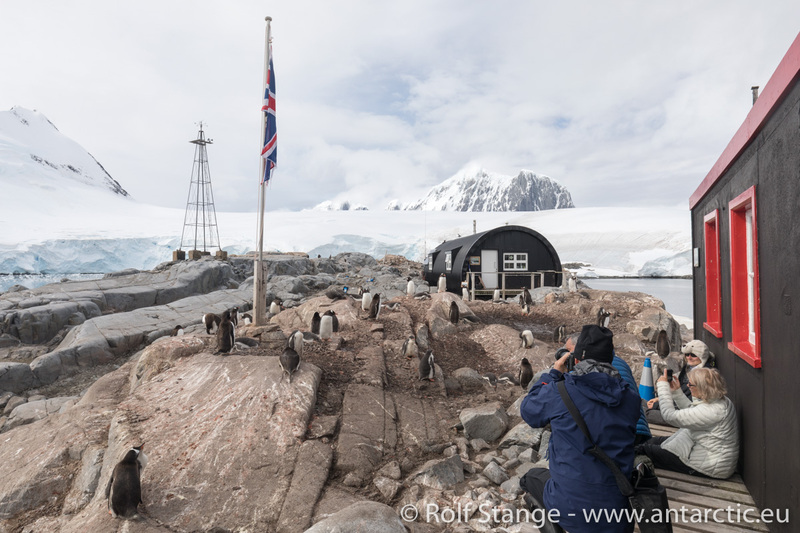 It was always nice to touch solid, antarctic ground, and now, given the nice, warm weather and the stunning surroundings, we just couldn’t resist. 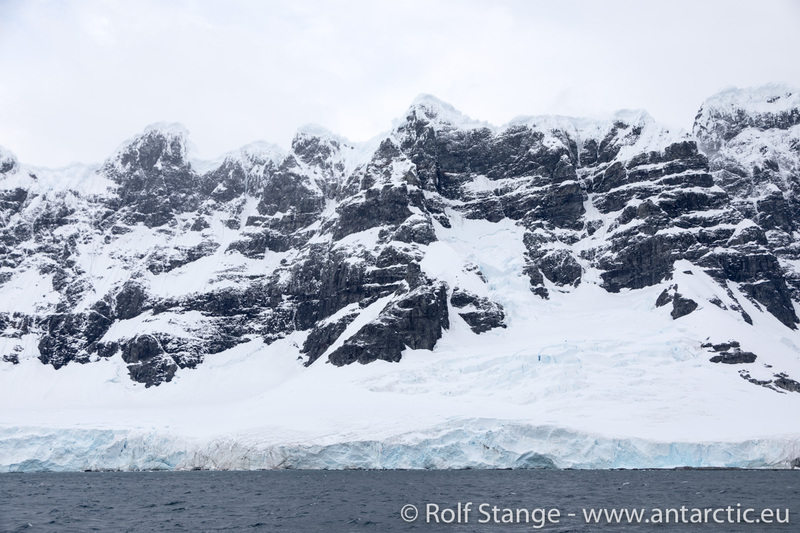 The mighty snow cliffs and ice walls of Enterprise Island were pretty close and provided a stunning bit of scenery for an extended rest. 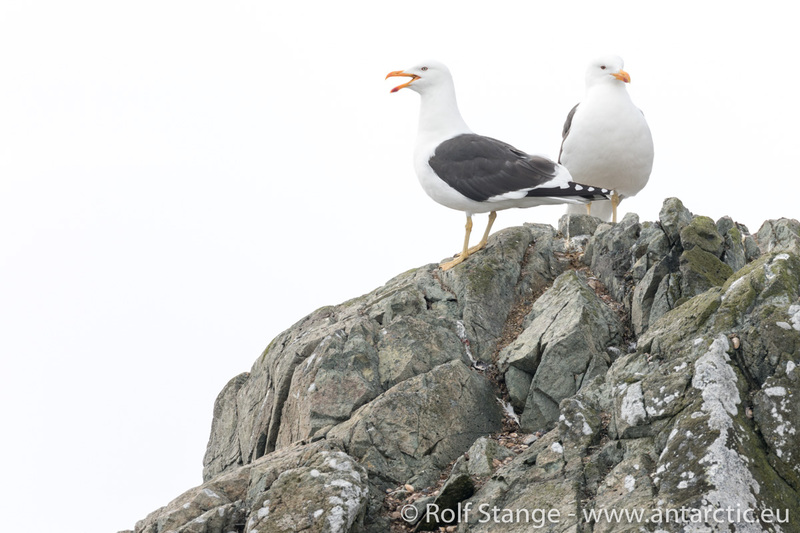 Up on the rocky hill, a couple of Kelp gulls and their chicks kept screaming at us, so we stayed near the shore and enjoyed the antarctic silence for a long time. 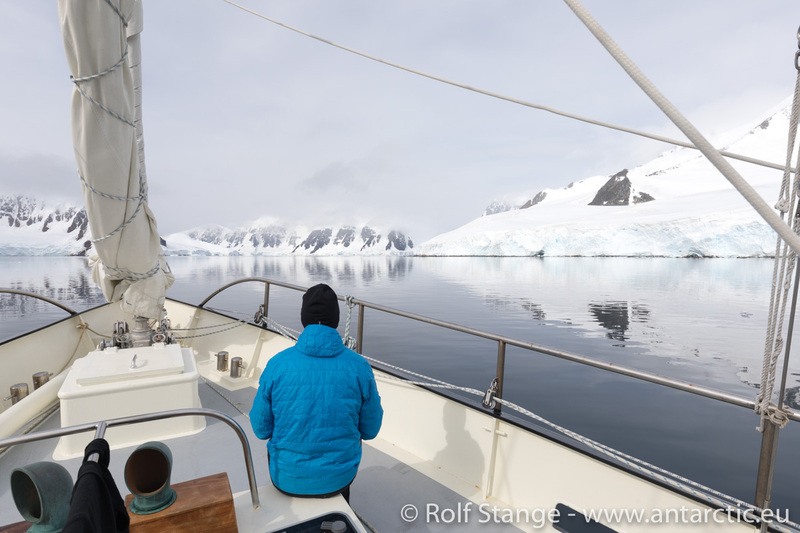 As it turned out, our little excursion of two hours had become quite a trip of a solid 4 hours duration, so we enjoyed relaxing the later afternoon on board. 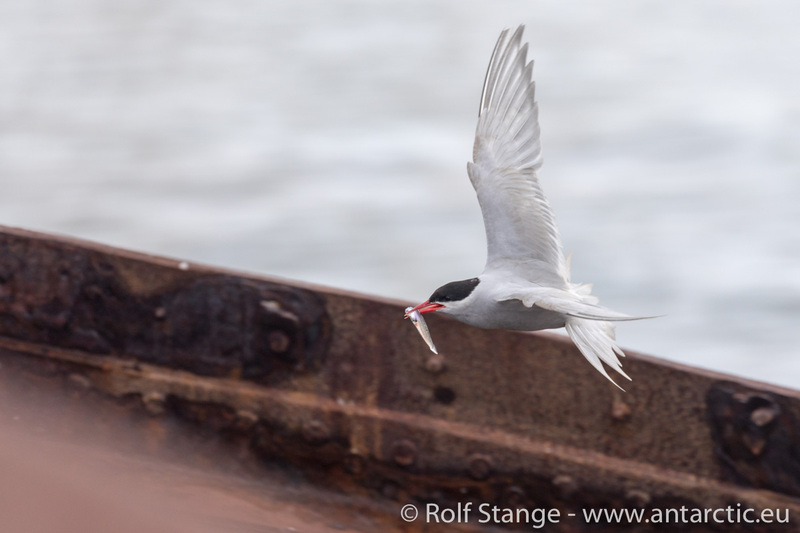 Marvelling at the views around us, photographing the Antarctic terns on the wreck of the old whaling ship next to us, sorting all the photos we had taken. 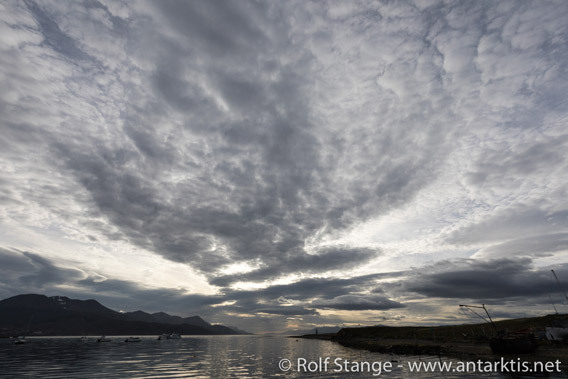 In the evening, Rolf, Franz, Mareike and Samuel went out again with the dingy to see if there were any whales nearby. This was not the case, so we could happily finish the day on board. 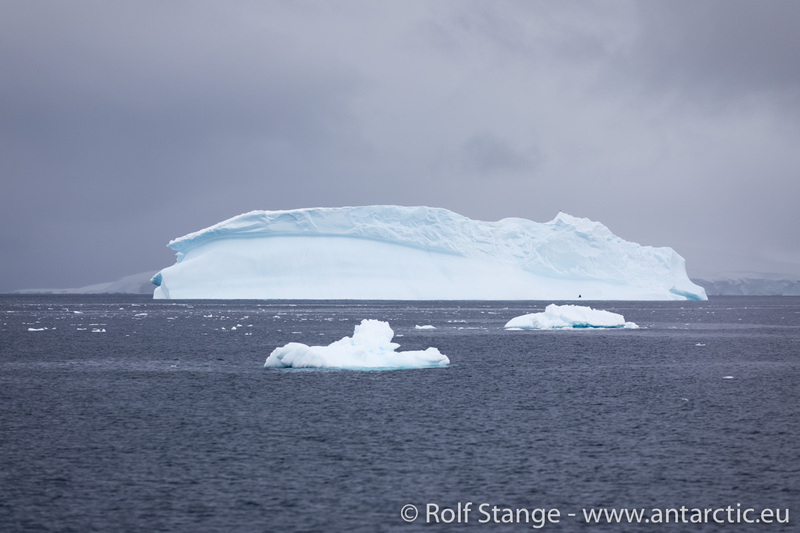 It had been quite a ride down south in Bransfield and Gerlache Straits yesterday. 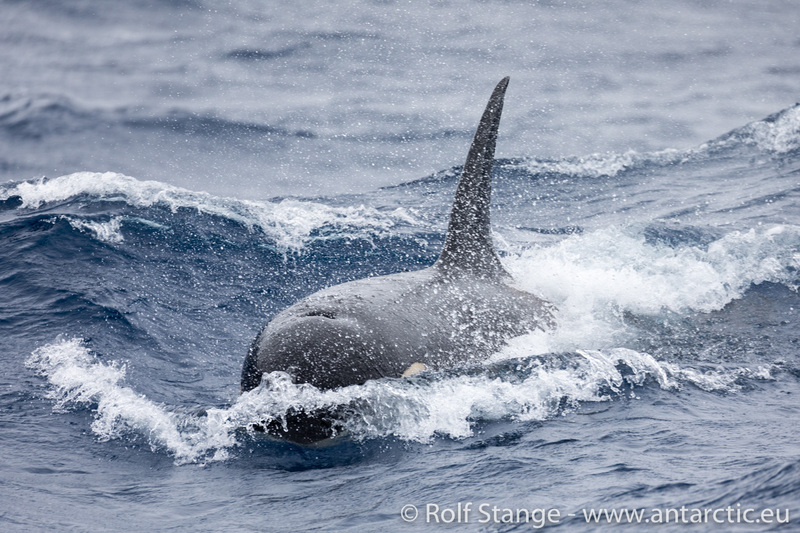 Starting with calm waters and whales, we got wind and waves later in the day. It was beautiful to wake up in peace and silence. Little splashes of water outside rather than big, hard waves. 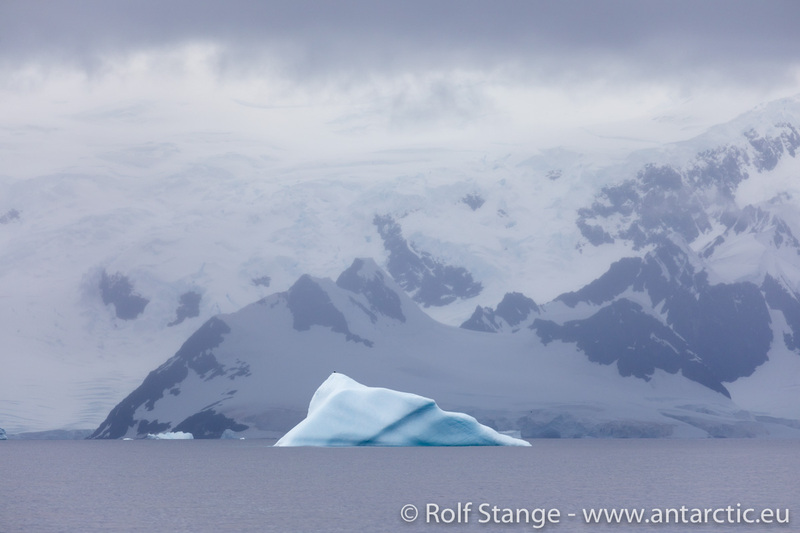 Icebergs and the endless, wild coastline of Antarctica! 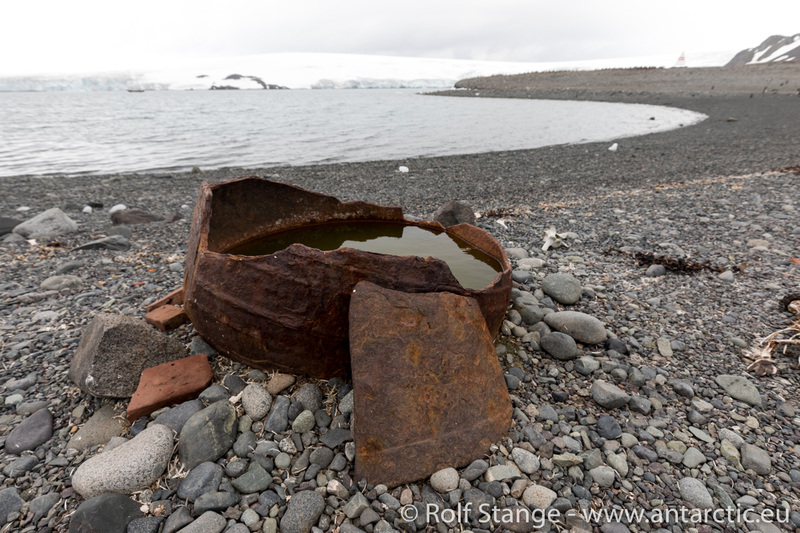 We went alongside the wreck of an old whaling ship at Enterprise Island. 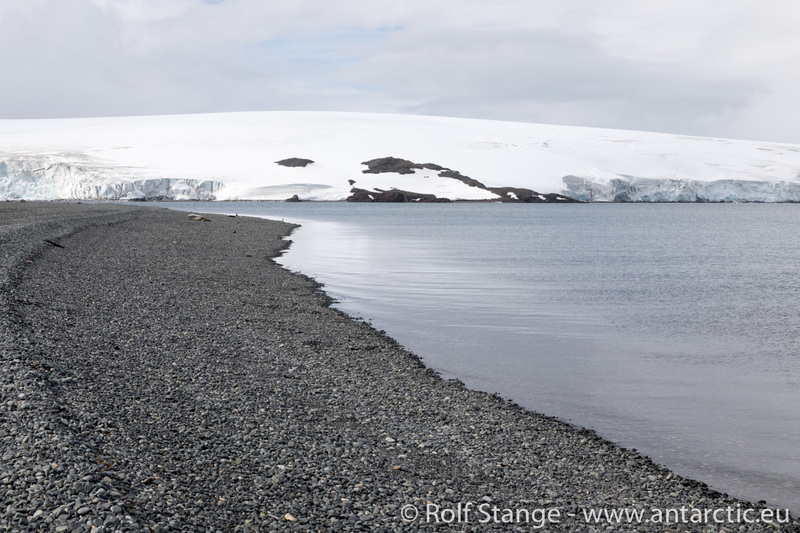 A lovely little bay, surrounded by ice walls. 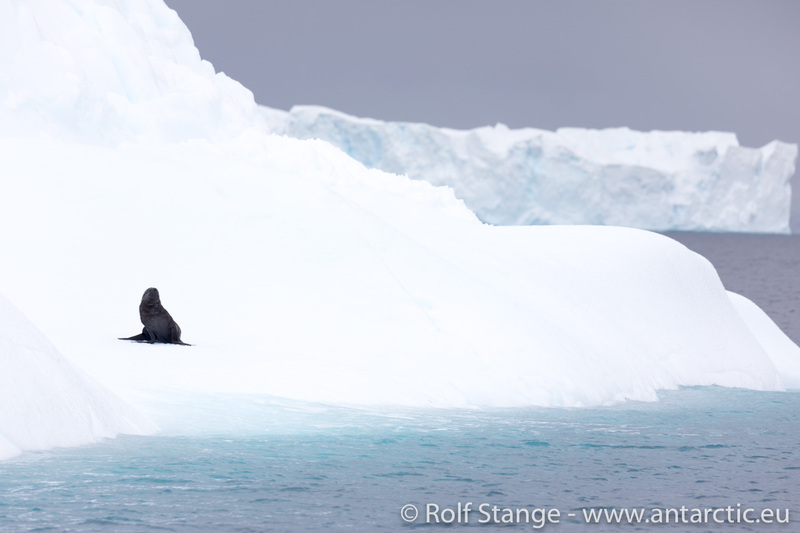 Soon we were on our way with the dinghys, making a landing on a tiny little island with old whaling boats, seeing seals, Blue-eyed shags and all sorts of of ice in various shapes and sizes. 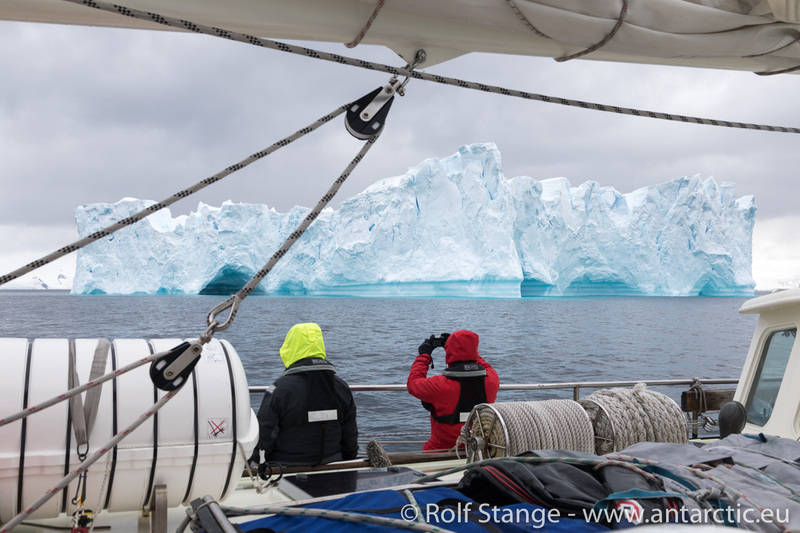 There was also a bit of wind and waves, not too much but enough to make it a rather cold experience considering we were out for a good three hours. 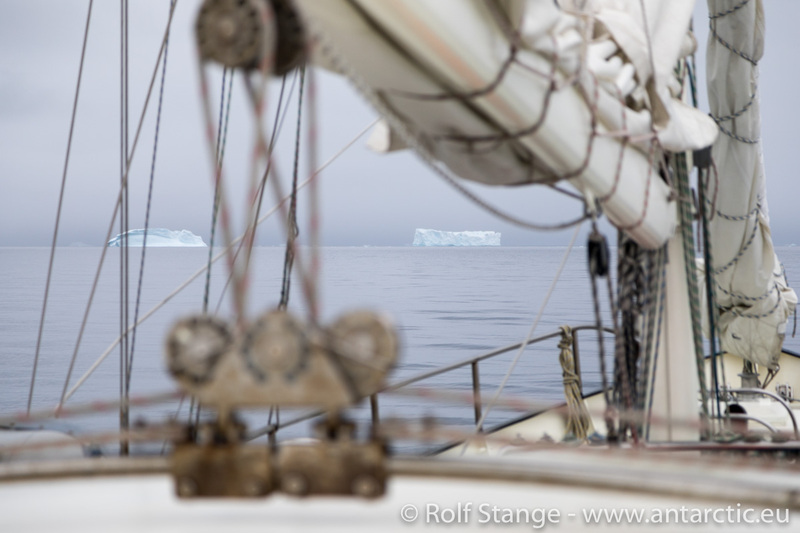 We enjoyed a very cosy evening on board, looking forward to a calm night without anchor watches. 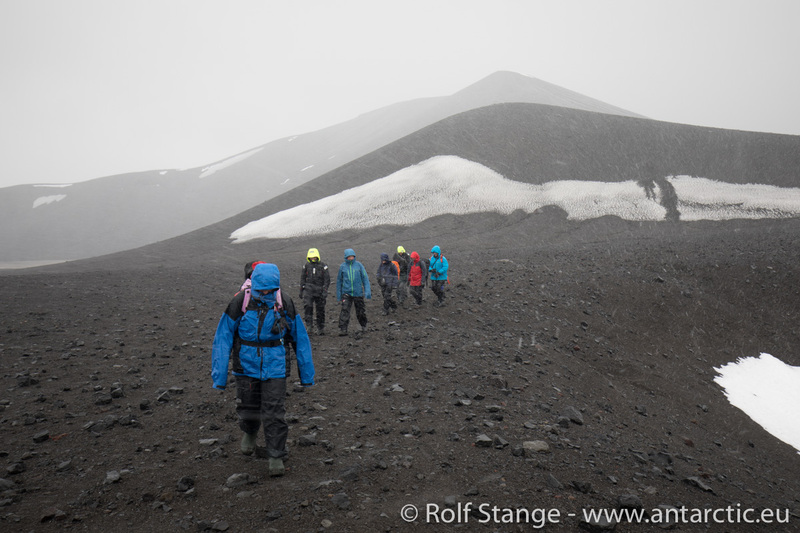 A little bit tired from the anchor watch, but very happy with our Deception Island experience, we lifted the anchor and set course for Greenwich Island, further northeast in the South Shetlands. 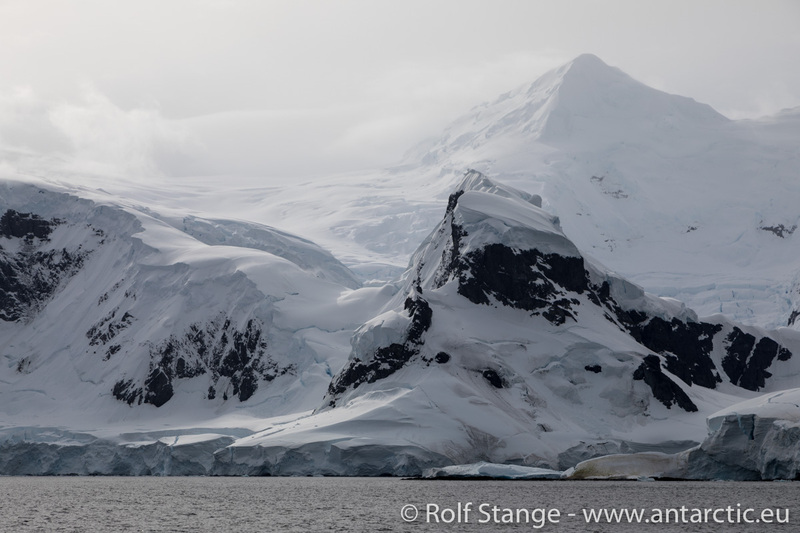 It was a beautiful passage, mostly under sails, a Humpback whale every now and then, and stunning views of the wild coast of Livingston Island. 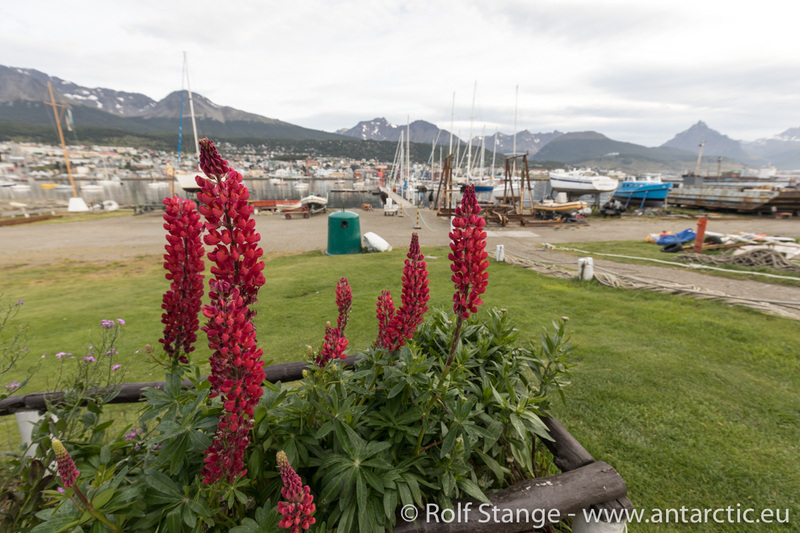 Yankee Harbour provides a splendid natural harbour for small boats. 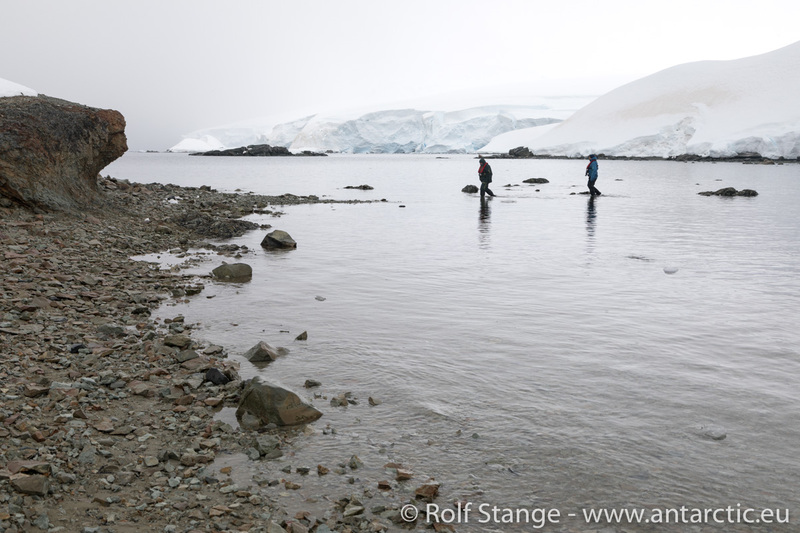 And plenty of space to move around on shore; more than we will have further south. So we were happy to get a chance to stretch our legs a bit. 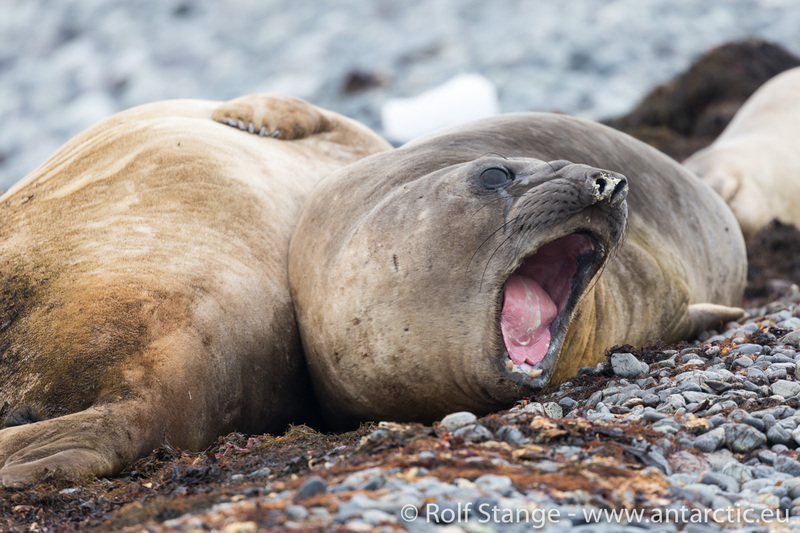 And as we had been hoping for, there was a little group of Elephant seals hauled out on the beach. 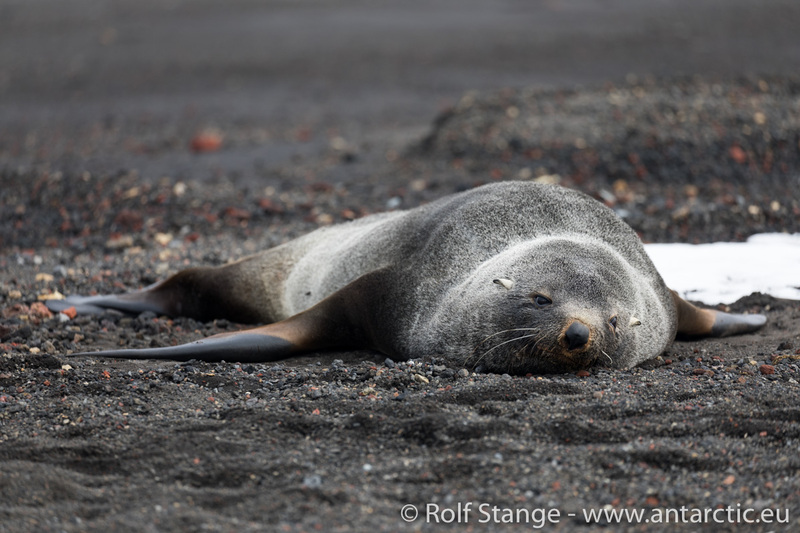 And individual Weddell and Fur seals resting on the beach. 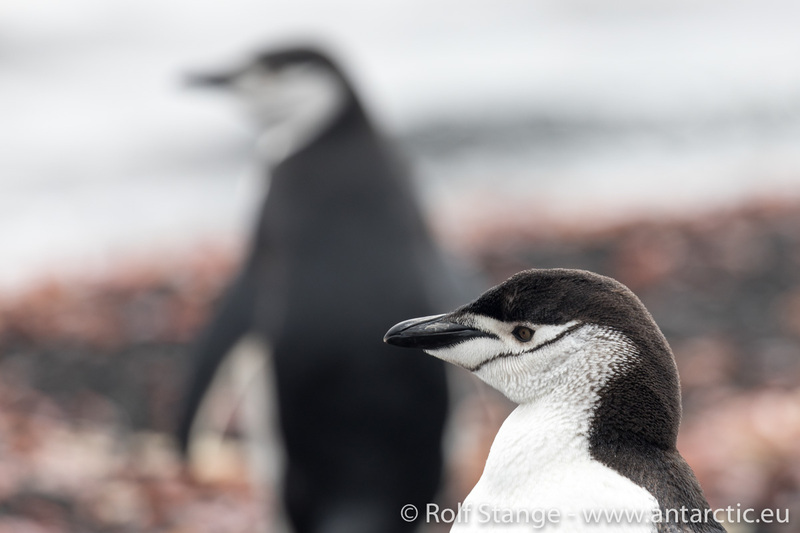 Penguins – mostly Gentoos, with the occasional Chinstrap penguin – were walking around, straying from their breeding colony which was at the base of the long gravel peninsula where we had gone ashore. 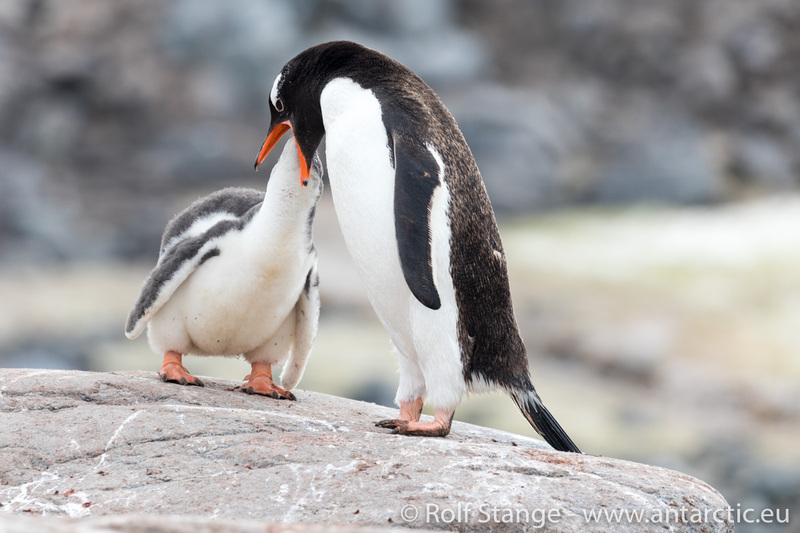 Our first Gentoo penguins! 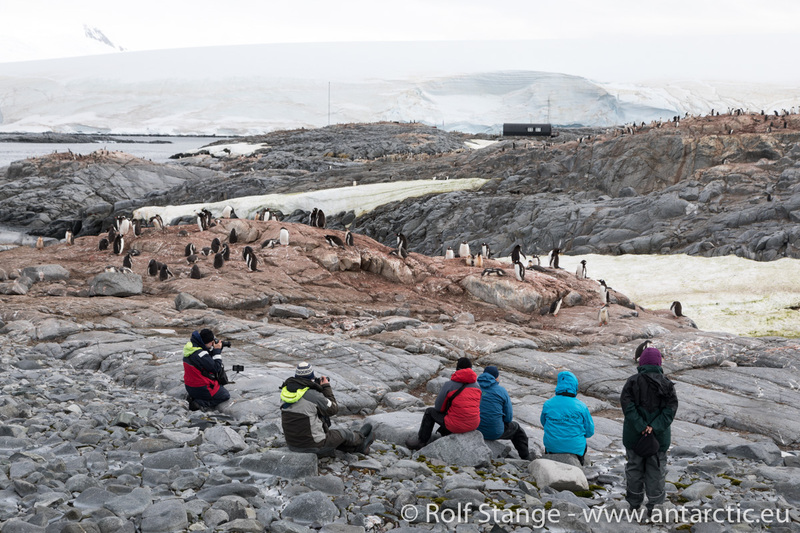 Of course we spent a lot of time observing and enjoying all the activitiy that was going on in their colonies. 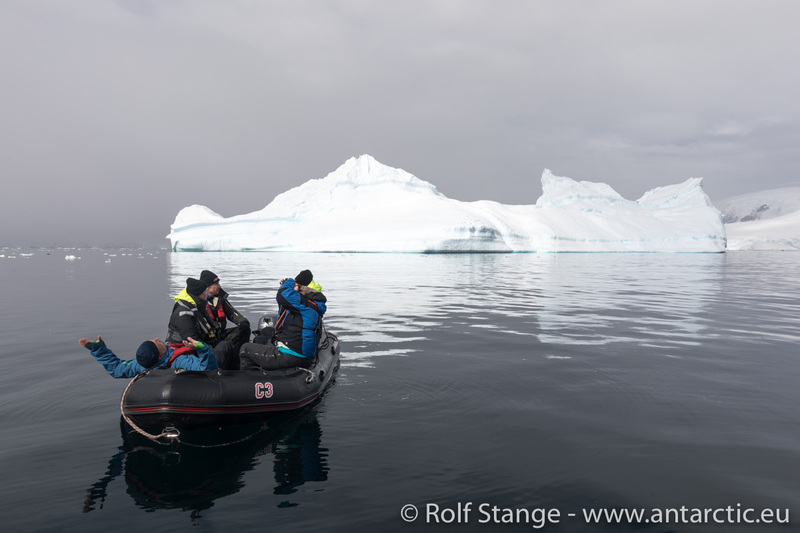 Several hours went by quickly, and finally a little bit of rain reminded us that it was time to return to our floating home. 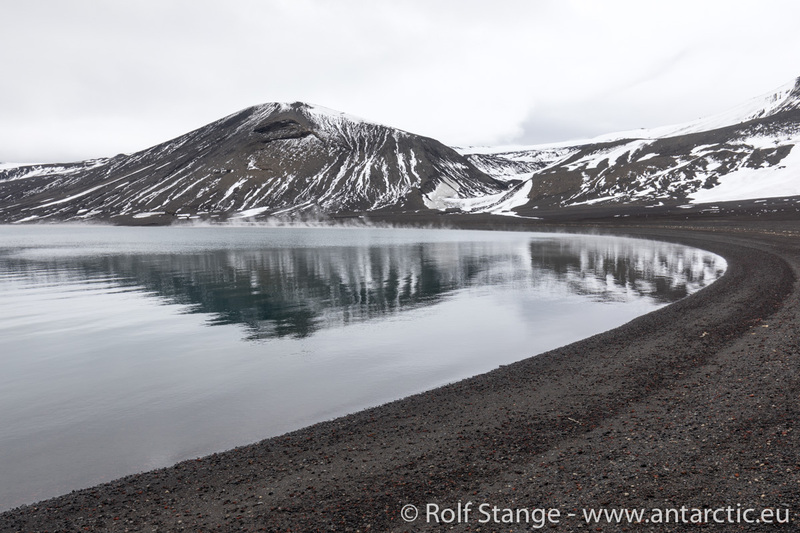 We have been more thorough with Deception Island than ever before. 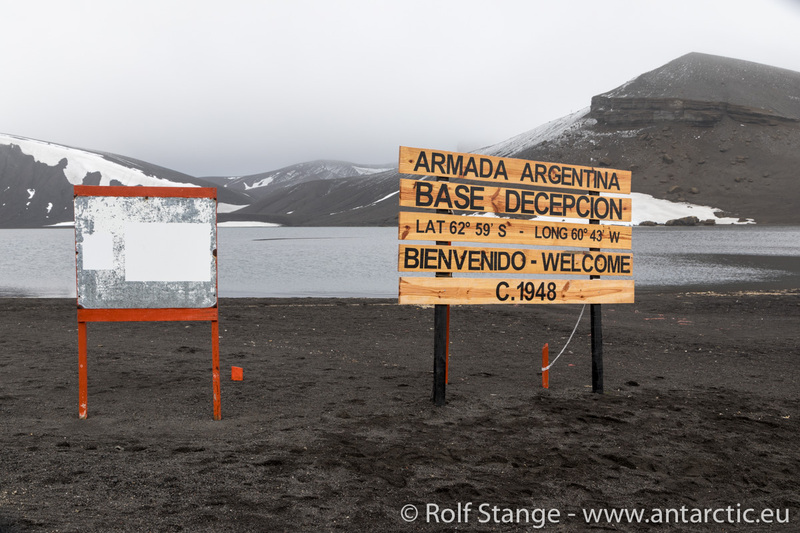 Starting with a rather spontaneous opportunity to visit the Argentine Base Decepcion. 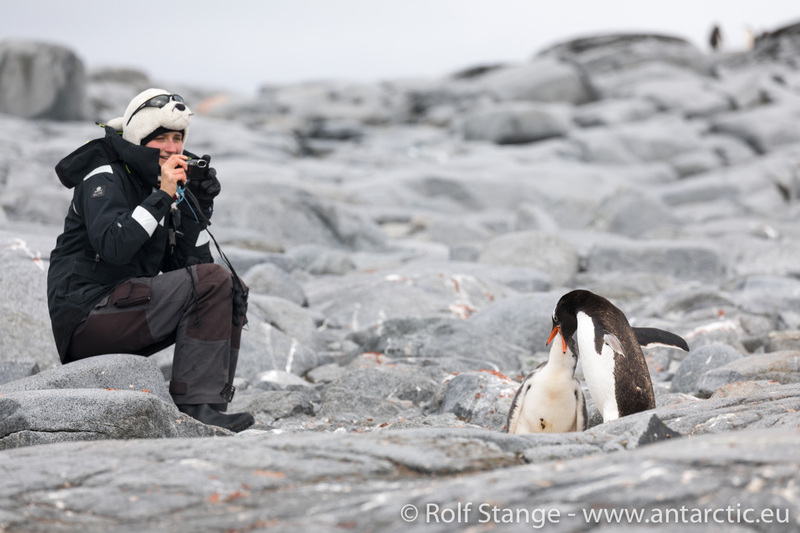 Station visits are such a thing, sometimes you feel that they are not really motivated to have visitors. 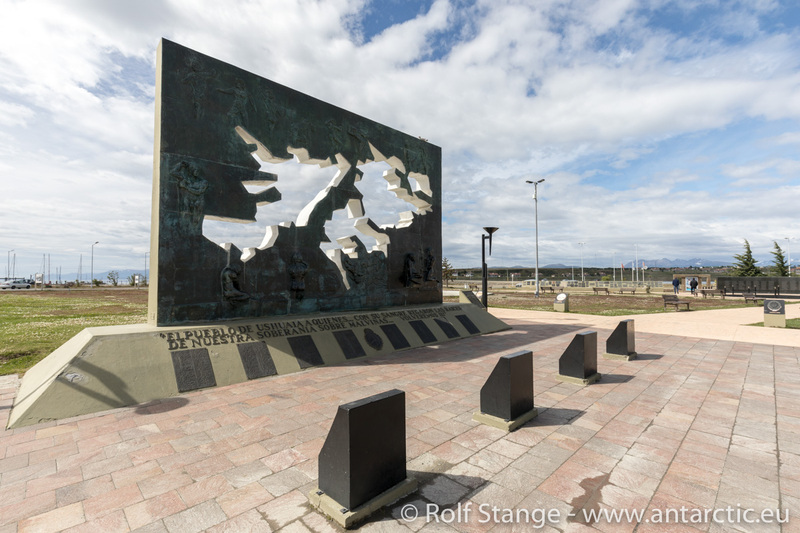 The Argentinians were motivated. Very friendly people. 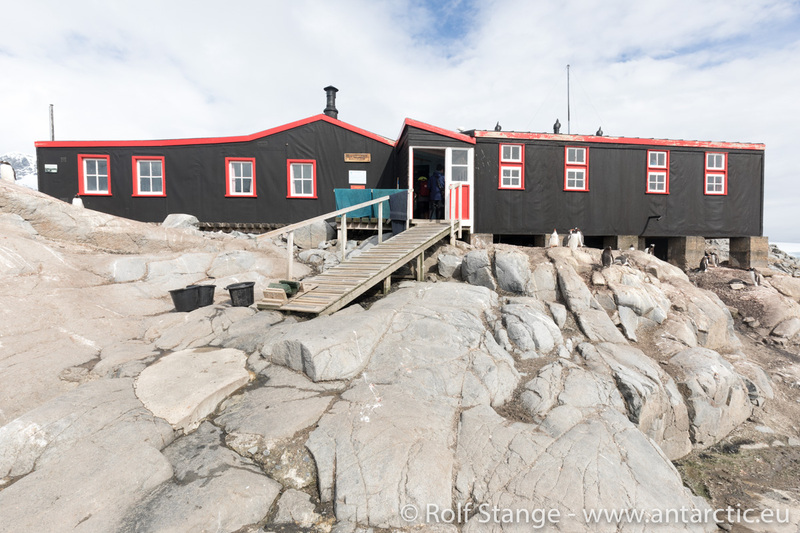 Of course, we had to have a look around the old whaling station in Whalers Bay. 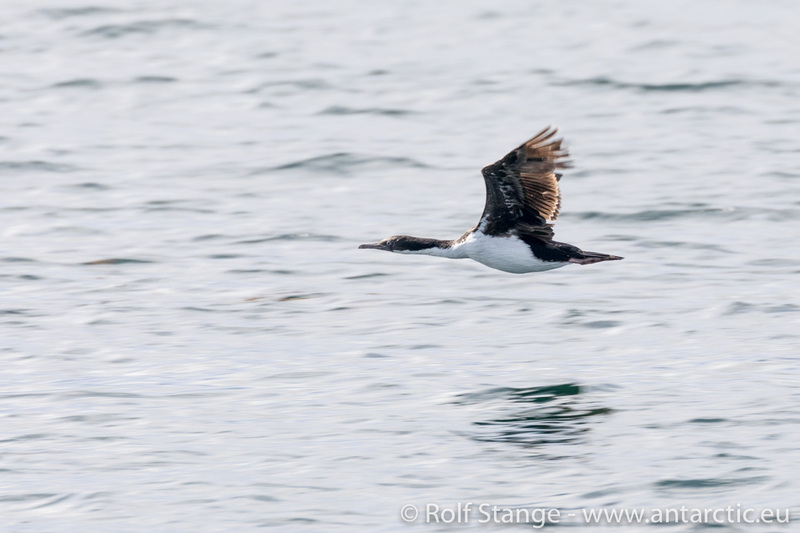 So we did – slightly compressed, as a bigger ship was entering the bay right behind us, threatening to crowd the place soon with a larger number of people. 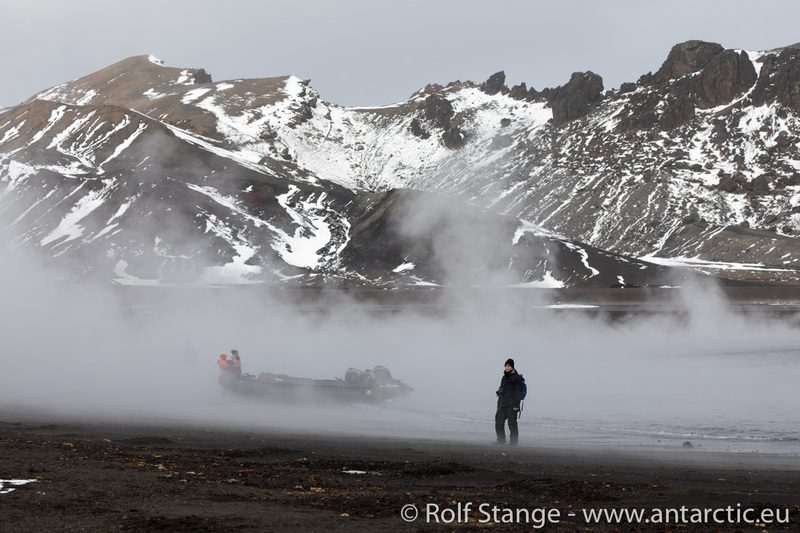 So we had a look around and steamed off (in the truest sense) to find peace and solitude elsewhere. We found peace and solitude in Pendulum Cove. 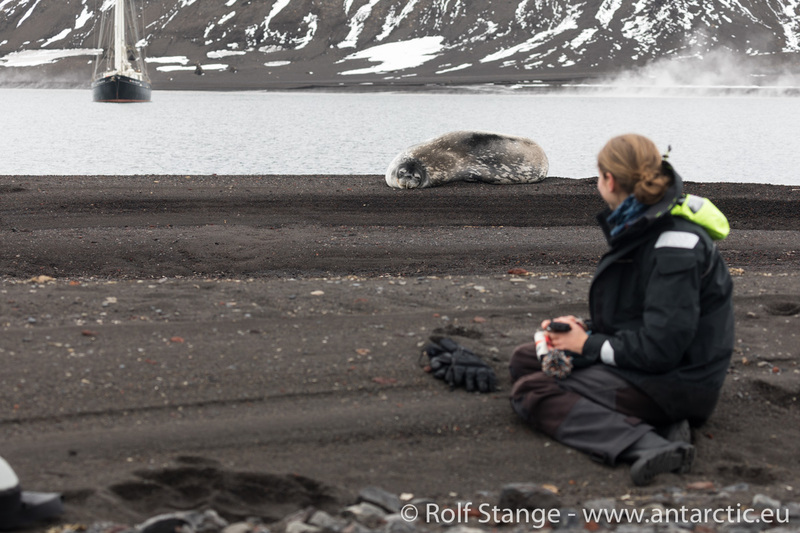 Nobody was really keen on the classical Deception Island swimming action. 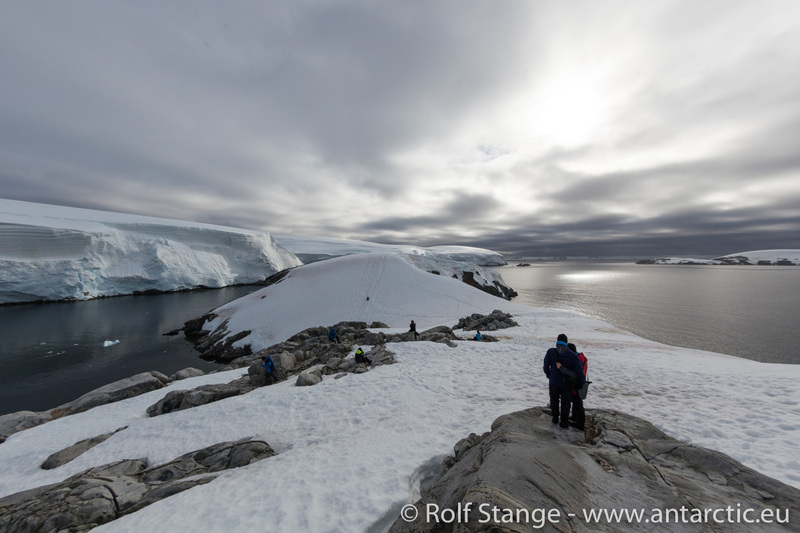 We rather walked around and enjoyed the scenery, the wildlfe and the fact that time did not matter for us. 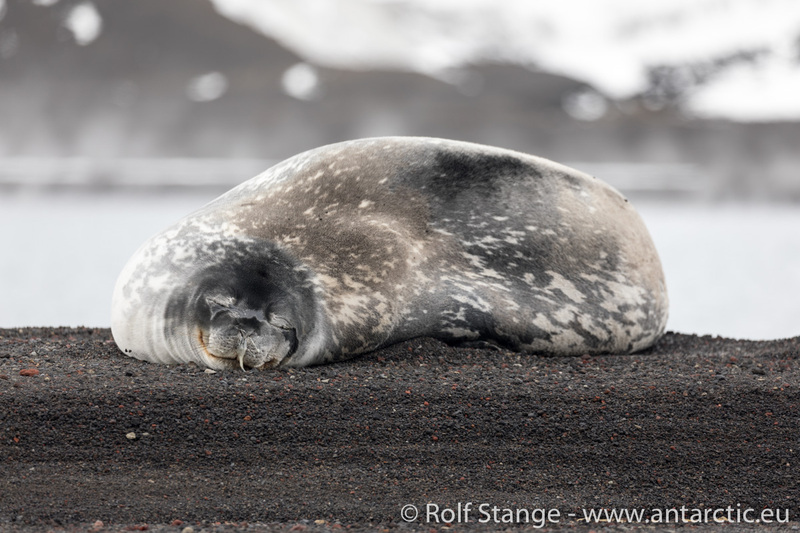 Two Weddell seals were hauled out on the beach, with a Skua patrouilling nearby. 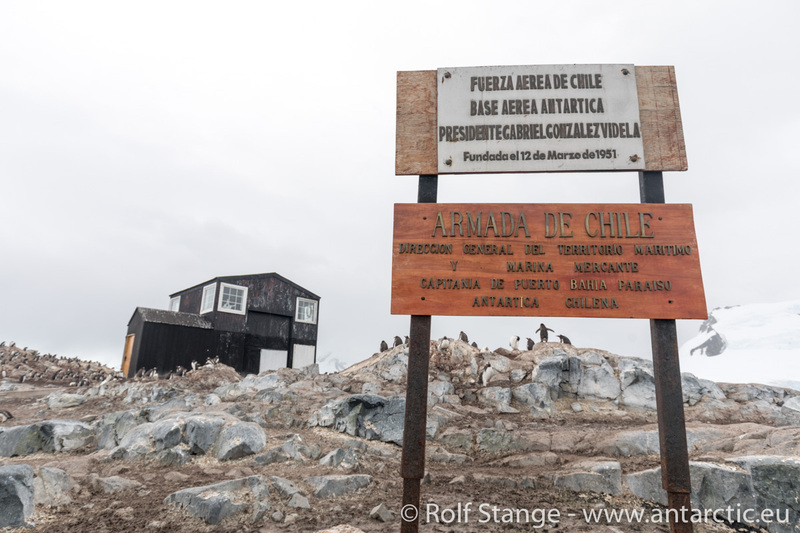 The remains of the Chilean stration that was destroyed in the 1969-70 eruption was not far away. 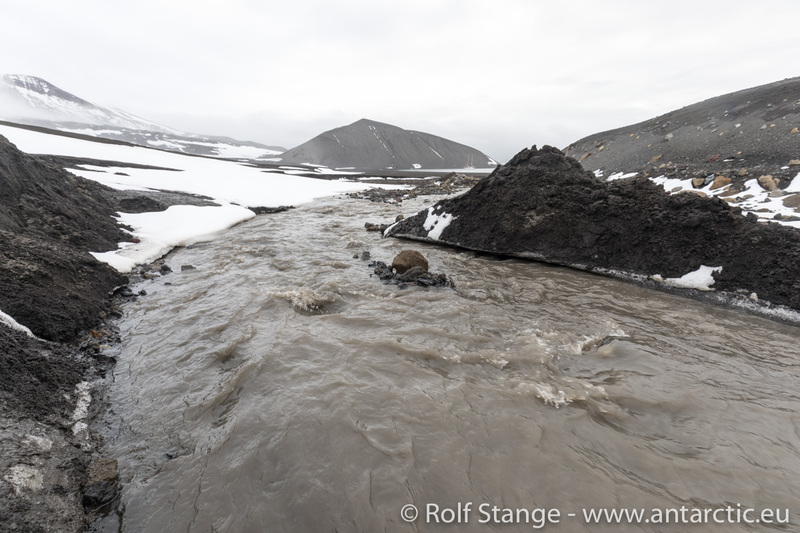 An interesting meltwater stream was emerging from an ice field in a little valley, and a bit further on, there were some huge blocks of lava rocks. More than enough stuff for a lovely late afternoon stroll. 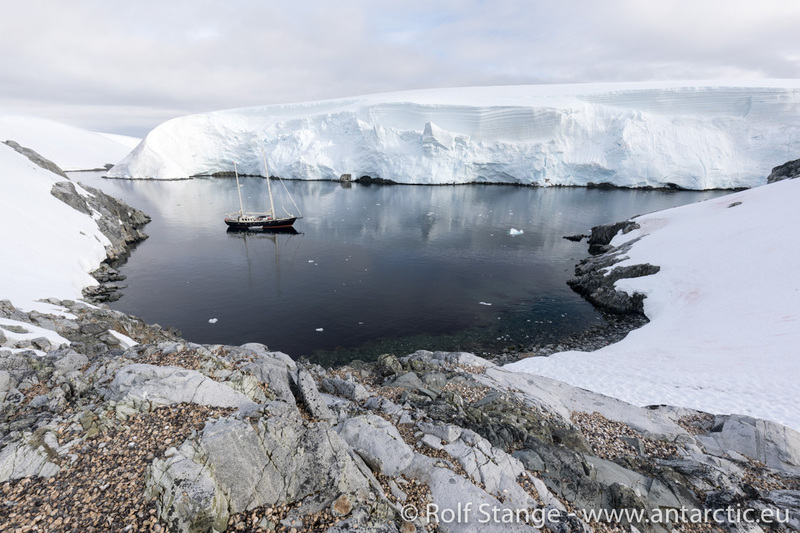 Now we are anchored again in Stancomb Cove, as yesterday, enjoying a calm night’s sleep around the anchor watches. 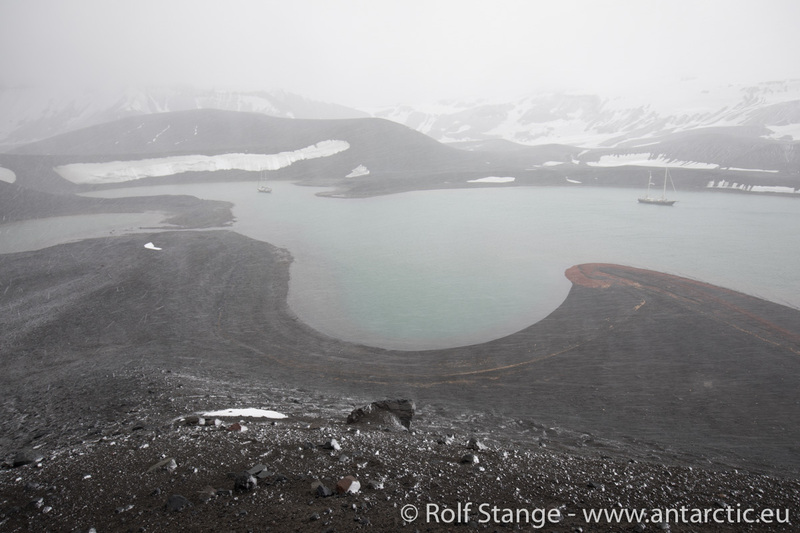 PS: Click here for the 360°-panoramas of Deception Island from past years. 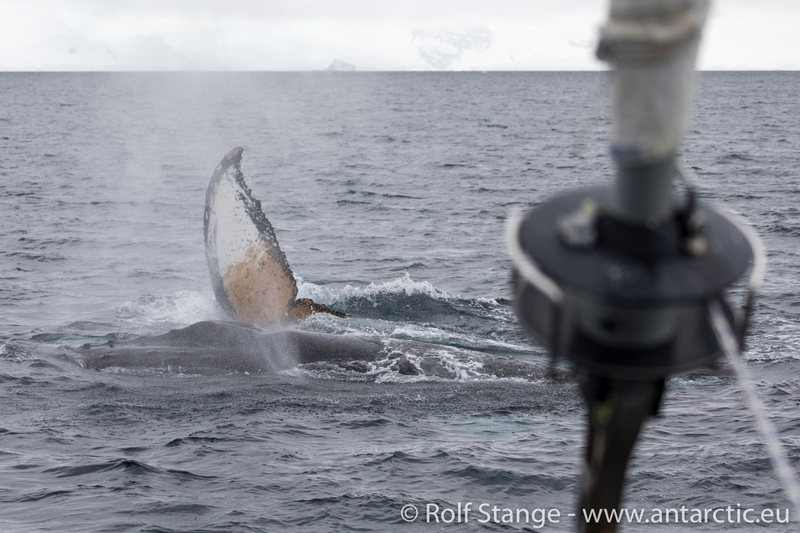 Yippie – the Drake-Passage is behind us! 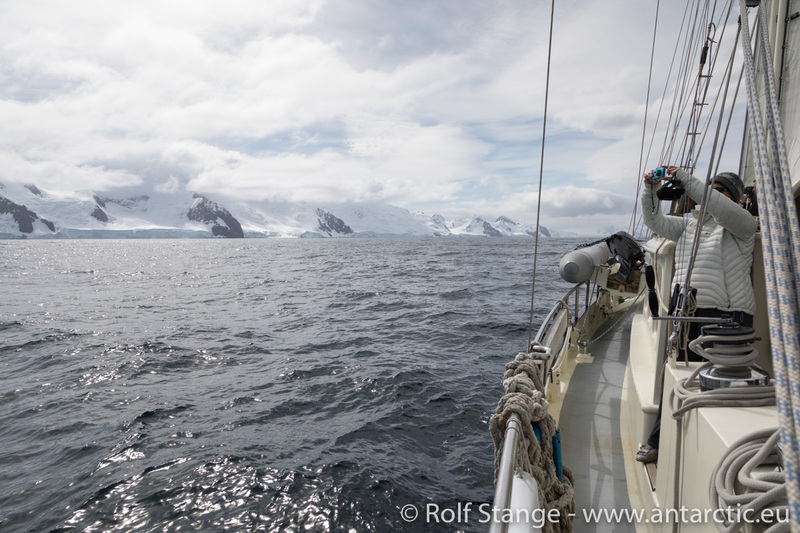 Last night, we sailed between Smith and Snow Islands into Bransfield Strait. Not that life was much better there. 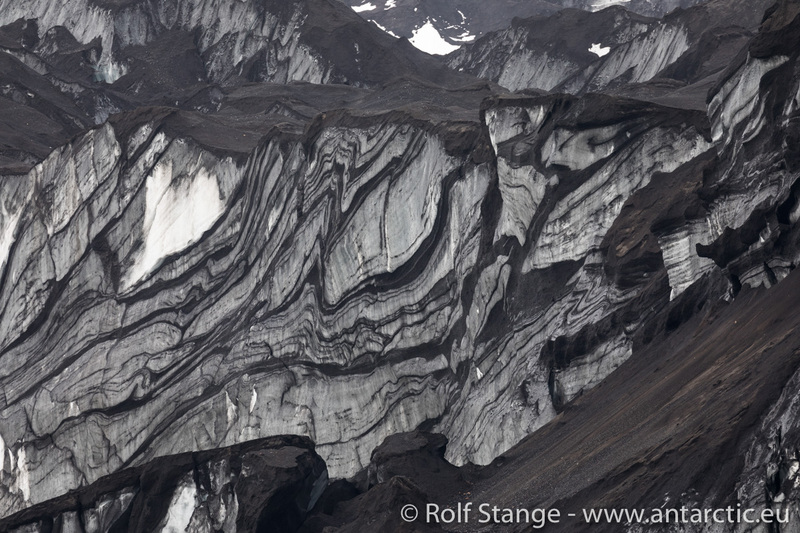 Wind force 6-7 directly on the nose – of course. 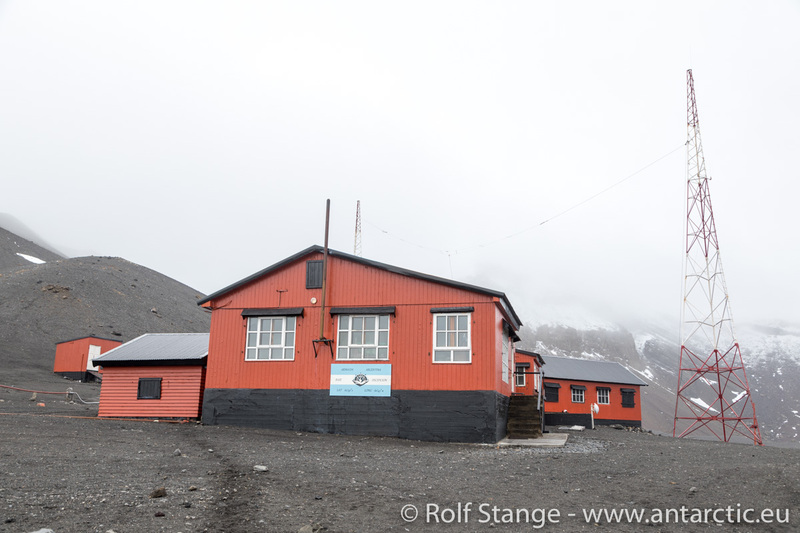 So we went for Deception Island, the nearest shelter available. 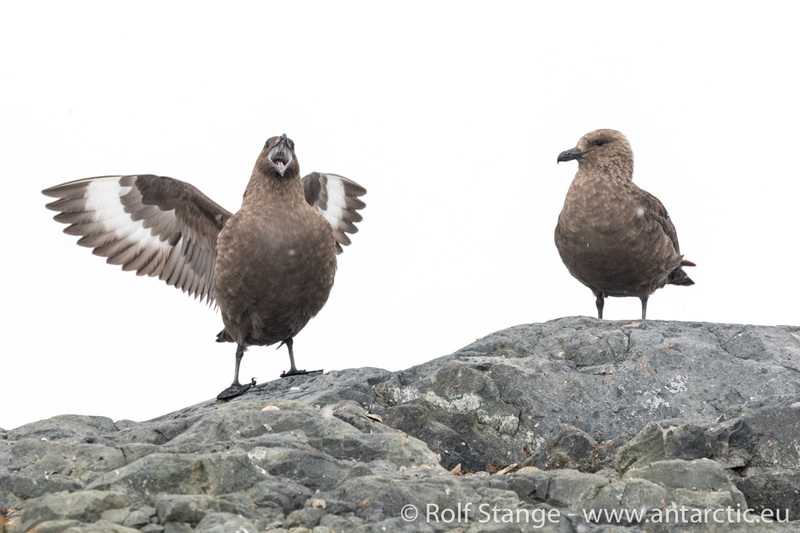 Windy, but protected from the big waves of the open sea. Yes, windy! 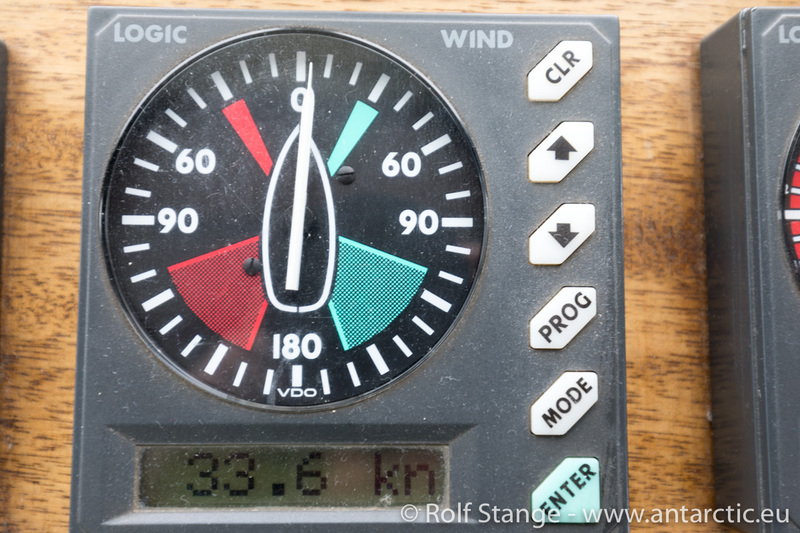 Up to a good 40 knots (that is where force 9 starts). 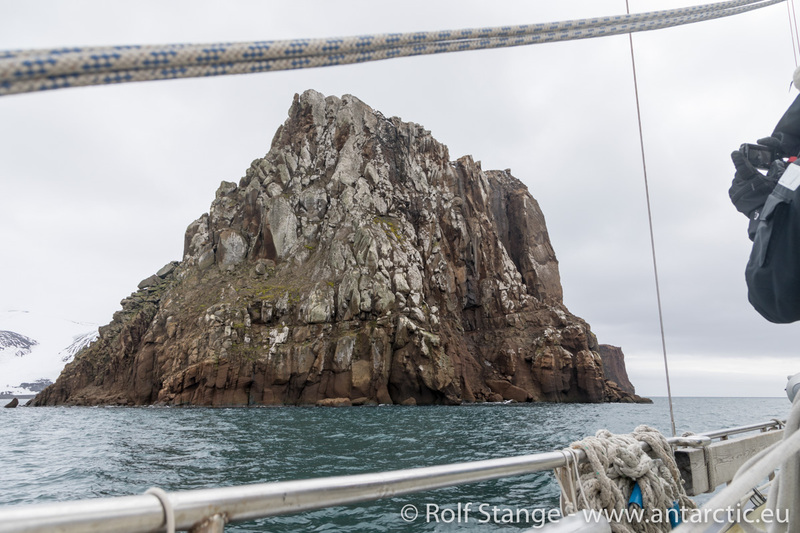 So it was really great to be an a small sailing boat that can enter a small bay such as Stancomb Cove and drop anchor there in perfect shelter. 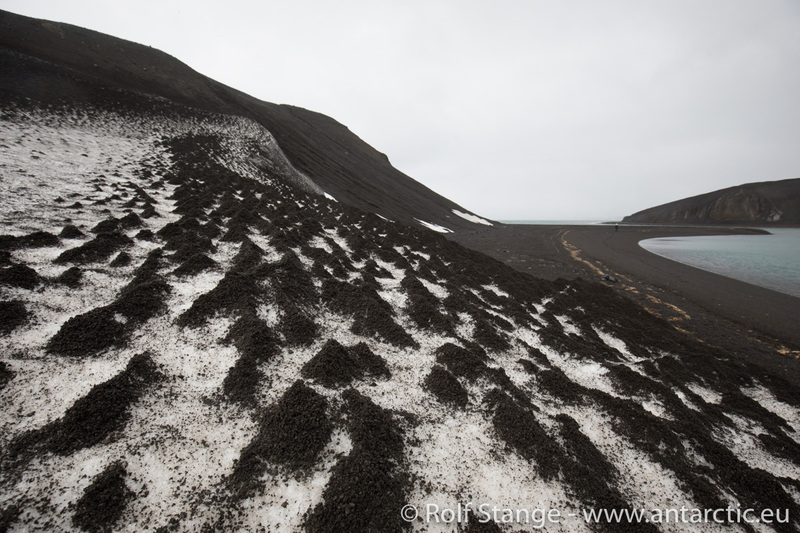 We could enjoy a good meal together and a lovely hike in the moon-like volcanic landscape. 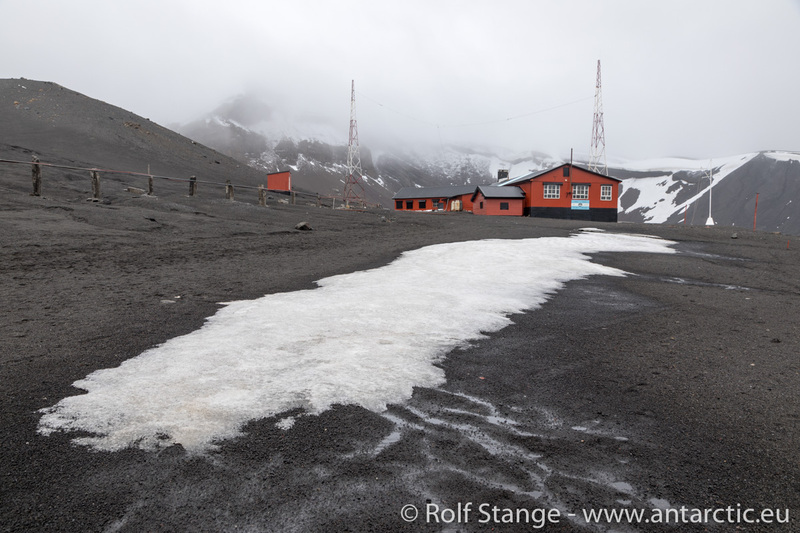 It was pretty wild, with horizontal snowfall and low clouds above the dark, completely barren land. Stunning. And now, in the evening, good spirits on board. A good meal, a nice glass with it. 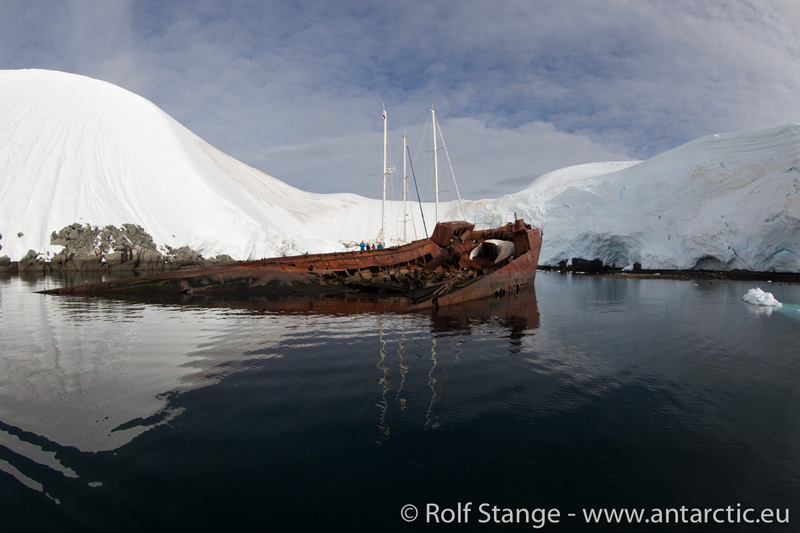 The ship well sheltered at anchor. See what tomorrow brings! Wind and weather are always big news here. 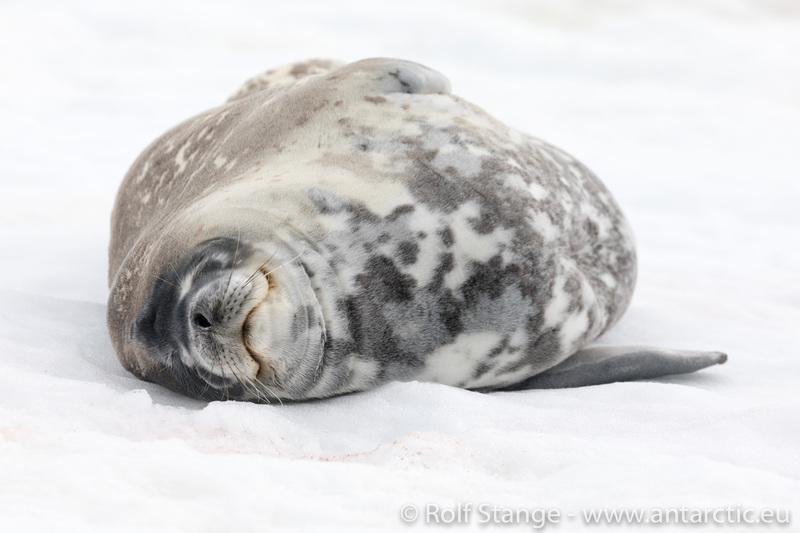 Sometimes the wind is stronger, sometimes it takes a rest. Never fully gone, never blowing up to a real storm. 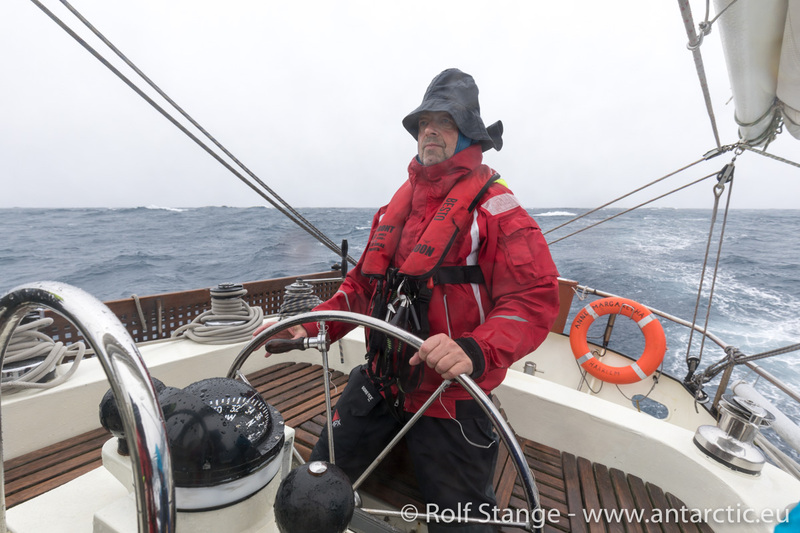 Earlier today, it was a bit stronger again, 25-30 knots (force 6-7), later it calmed down again. 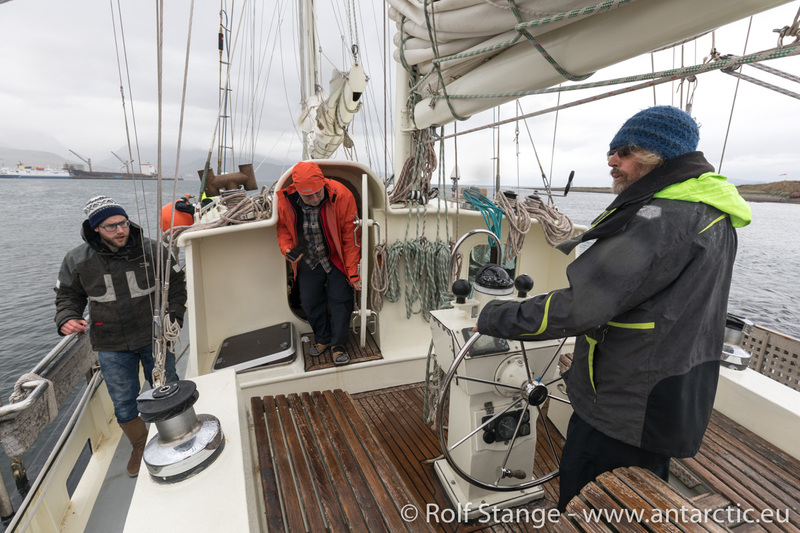 When we have more wind, the sails yield a good benefit and then we steer manually, which makes being on watch much more interesting. 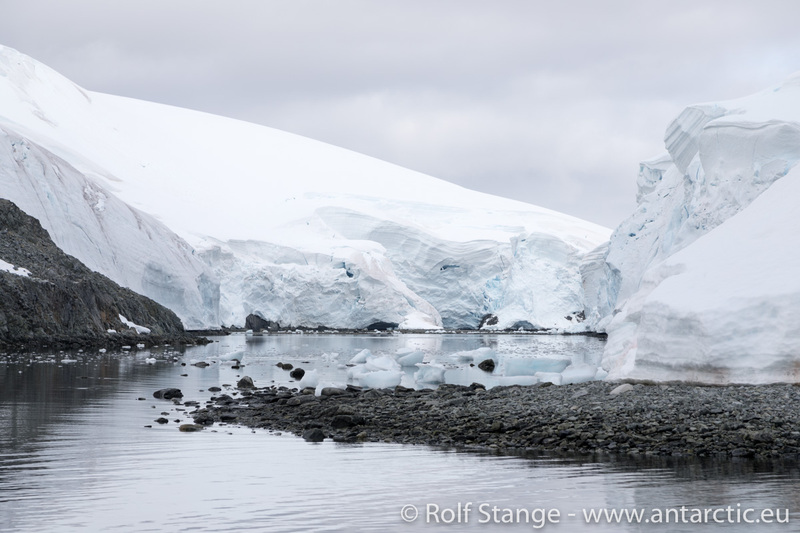 Currently, being on watch means just watching out for potential pieces of drifting glacier ice (growlers and bergy bits), but we haven’t seen any of their likes yet. But it can’t be far. 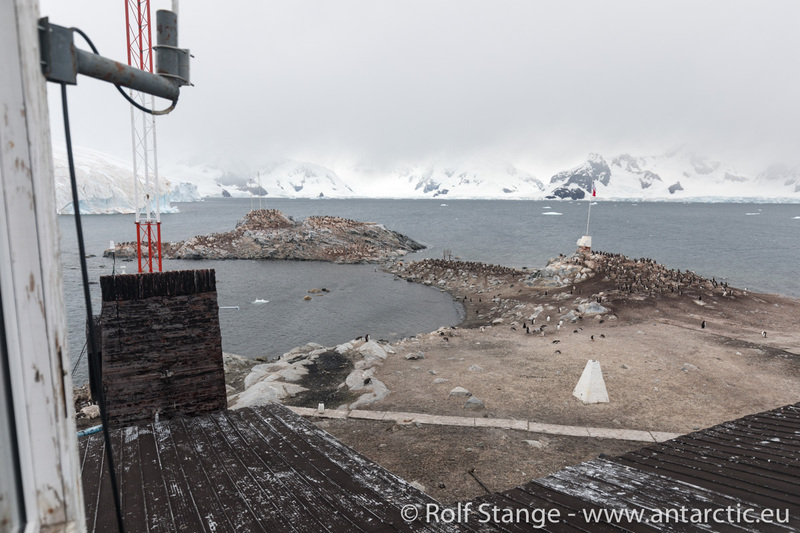 We have crossed the Antarctic Convergence (the oceanographic-biological boundary to Antarctica) and the 60th parallel (the political boundary to Antarctica) yesterday. 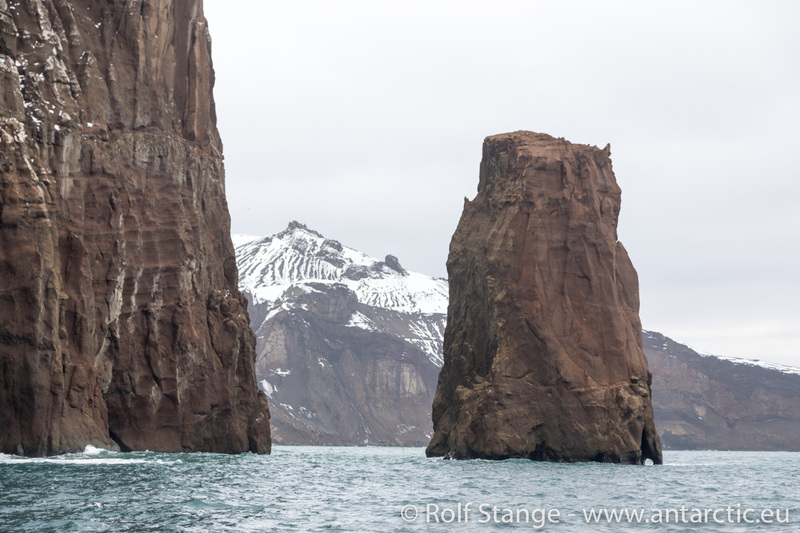 The South Shetland Islands are within 40 nautical miles now. We should be able to see them if the clouds were a bit higher, but it is not clear enough for that distance. 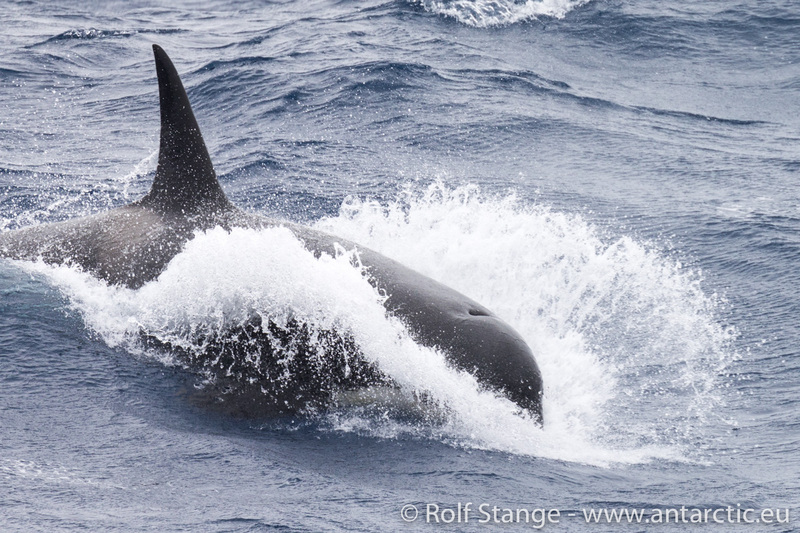 The main attraction today were clearly the Orcas! 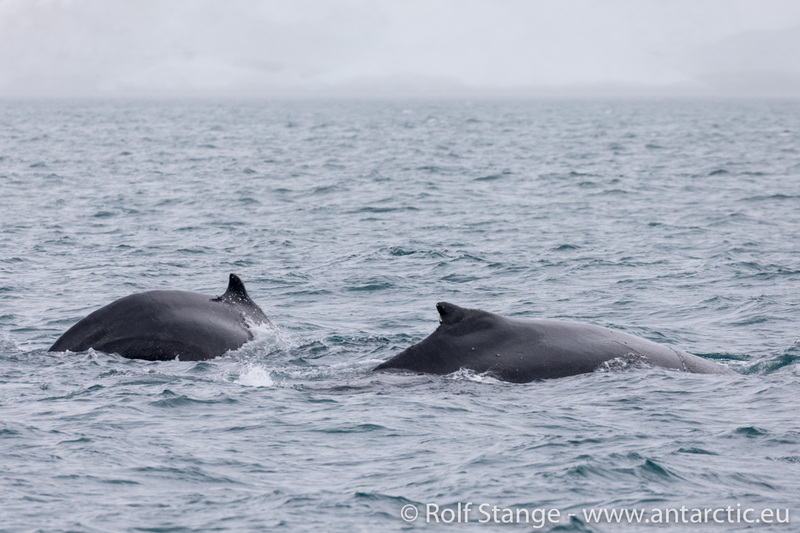 There was a small pod around mid-day, clearly curious about us, as they came all close to the ship, one by one. 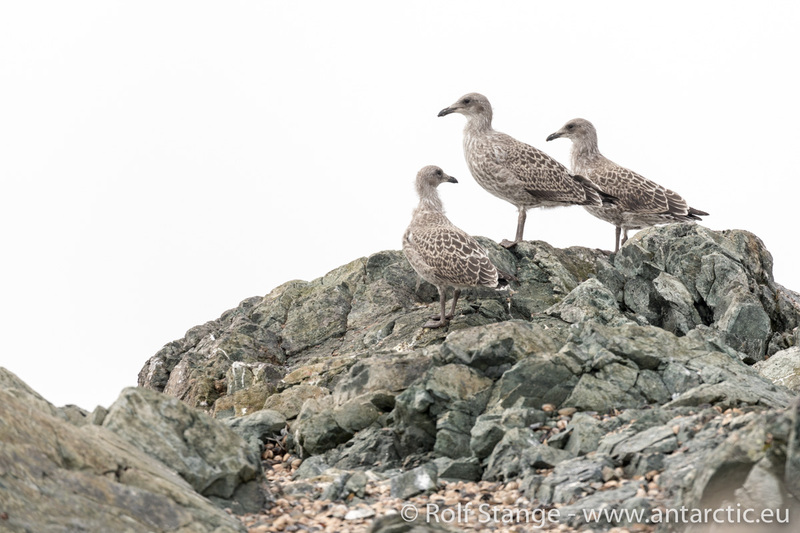 An amazing view how they surfaced from the big waves to disappear again a few moments later! 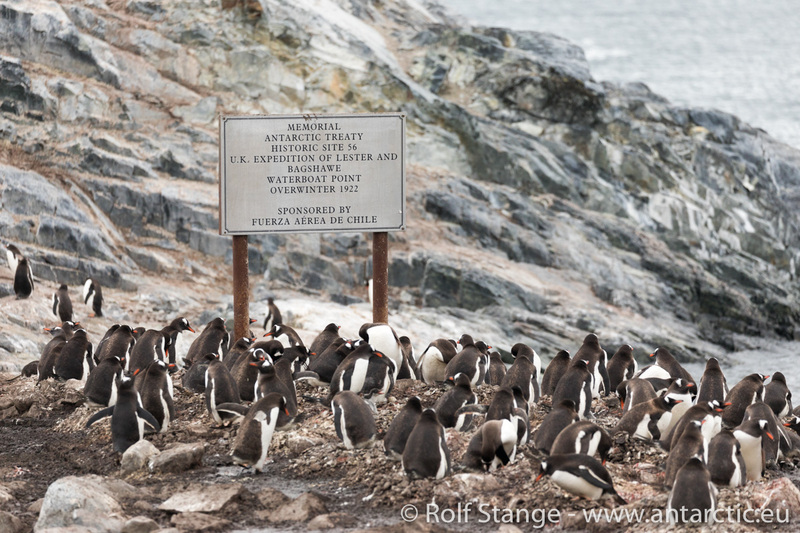 Great fun unless you are a penguin or something else on their menue. 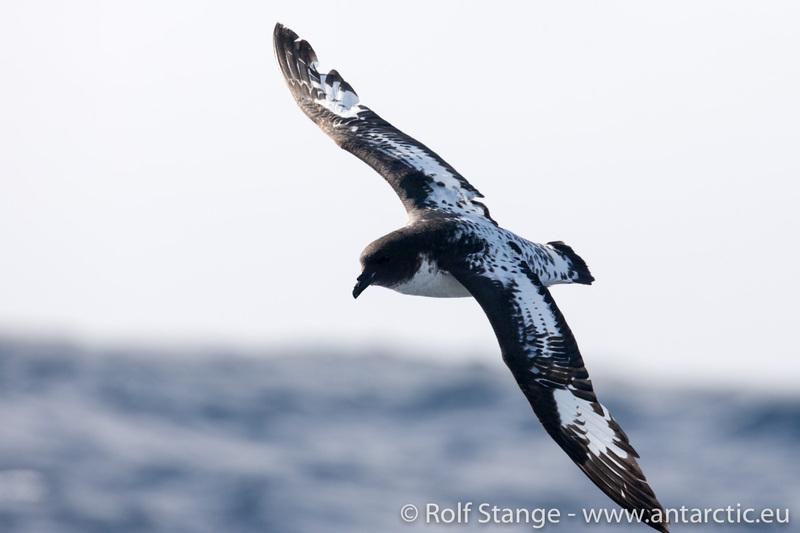 Birdlife was a bit limited until recently, but now, we have got Cape petrels and Southern fulmars, indicating the presence of land not too far way. 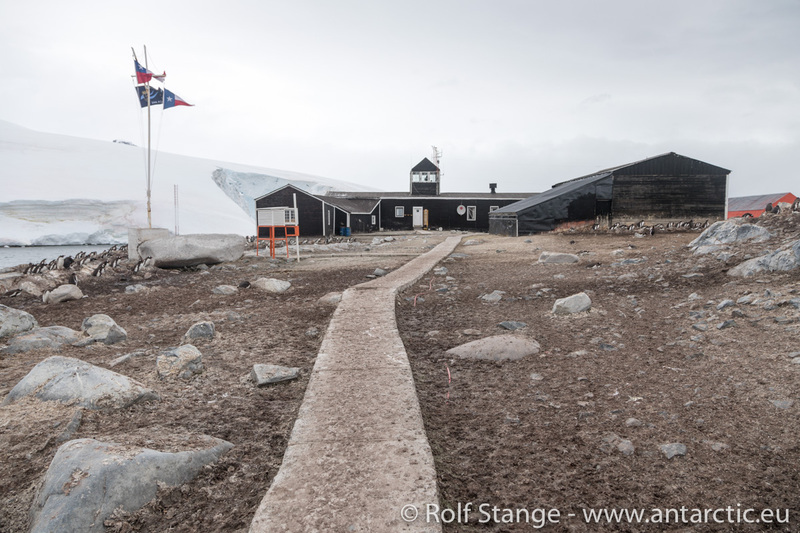 Tomorrow we should have our first opportunity to step on antarctic ground, and it is safe to say that we are all looking forward to that! 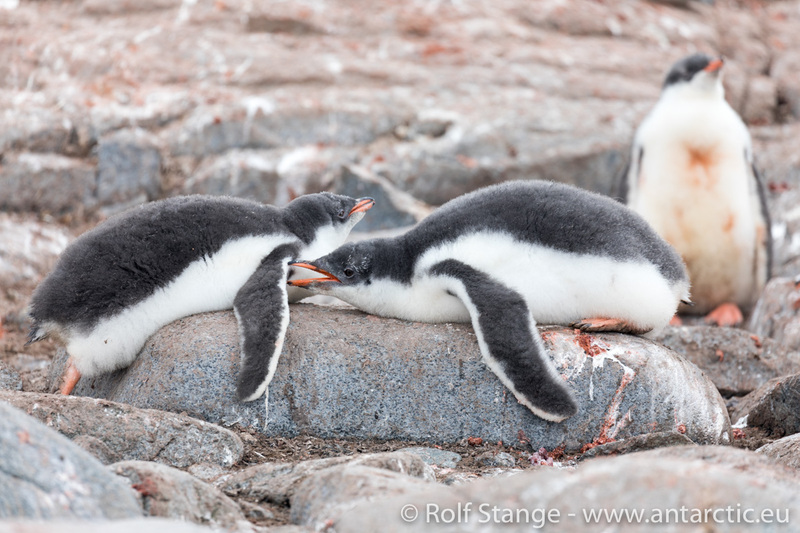 18-19 January 2018 – So now we are really on the way! 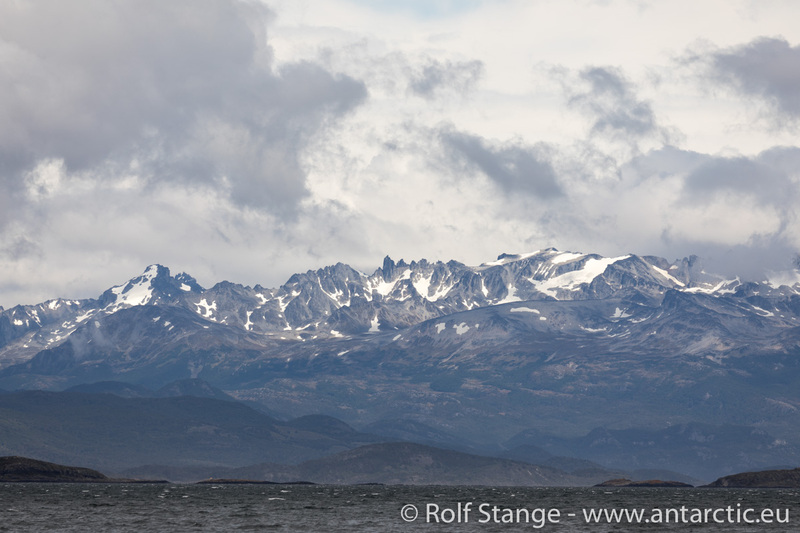 On Wednesday, we cruised through the Beagle Channel again, and we reached the open sea on Thursday during the early morning hours. 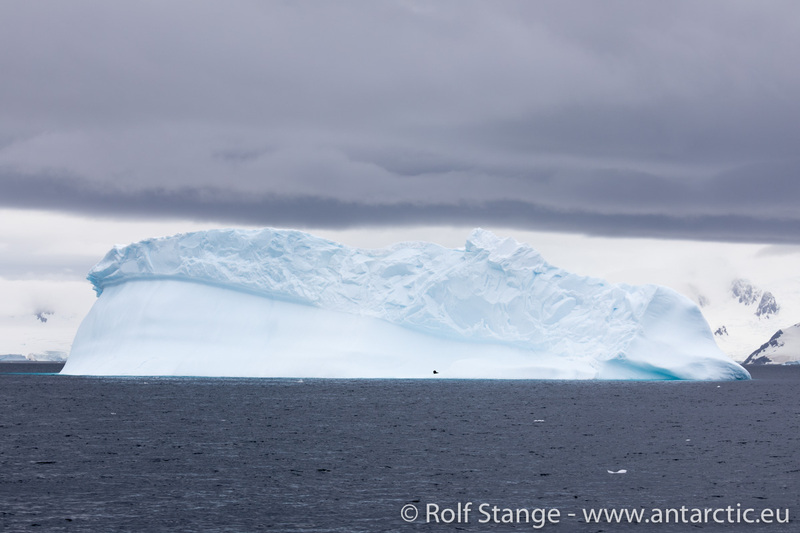 Since then, we have had everything between force 4 and 8 on the Beaufort scale, resulting in a daily life on board that you have to consider almost comfortable, at least in relation to the expectations one should realistically have in the Drake-Passage on a 22-metre boat. 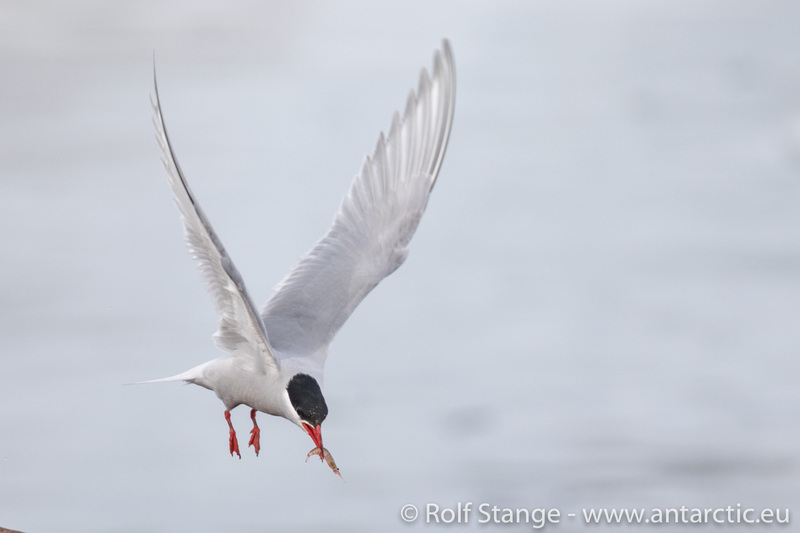 Which does not mean that everybody is constantly smiling, there has been some fish feeding, but all within reason. The watch scheme gives us some orientation in time which is otherwise rather indifferent, so we are living pretty much from watch to watch. Four hours on and eight hours off, that’s the deal, following good maritime tradition. 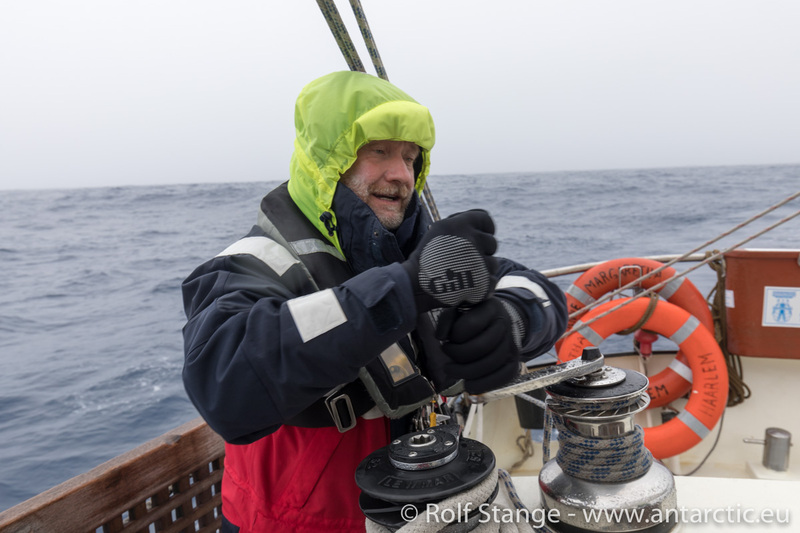 There are several of us in each watch group, so we can take it in turns on the wheel, usually spending half an hour so we can swap before we get cold. That’s altogether not too bad at all. 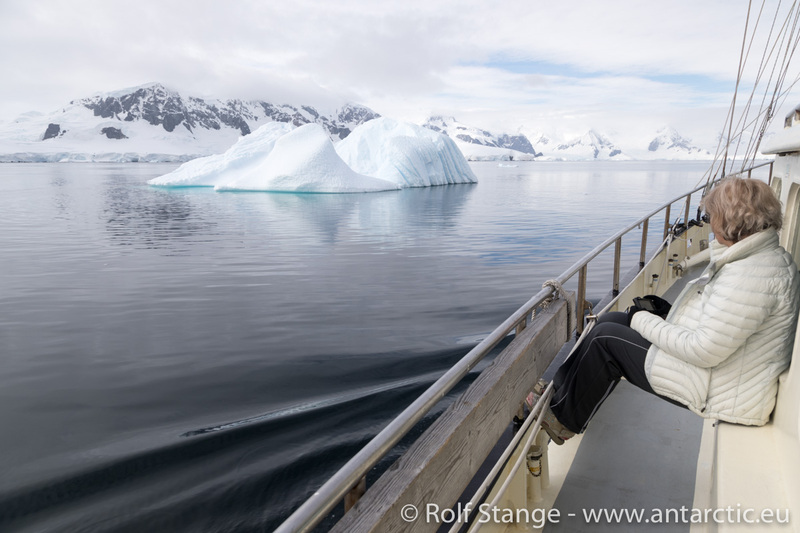 Nobody is forced to do anything in case of seasickness or whatever, but for most, being outside and steering the ship is actually a pretty welcome change from the routine otherwise. 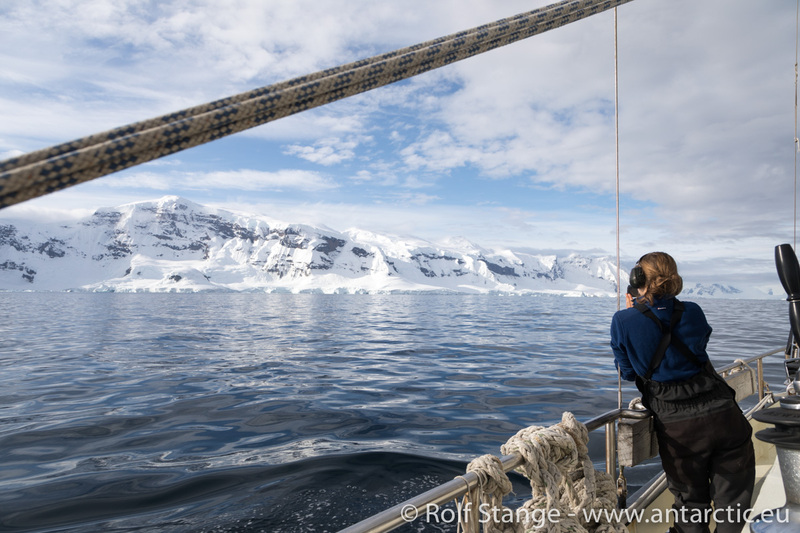 Being on your own on deck for a little while, sharing time with wind, waves and the occasional Giant petrel or Black-browed albatross that is passing by, is a good thing. Time is getting slower, and this constant urge to get something done is already left behind somewhere beyond the northern horizon. 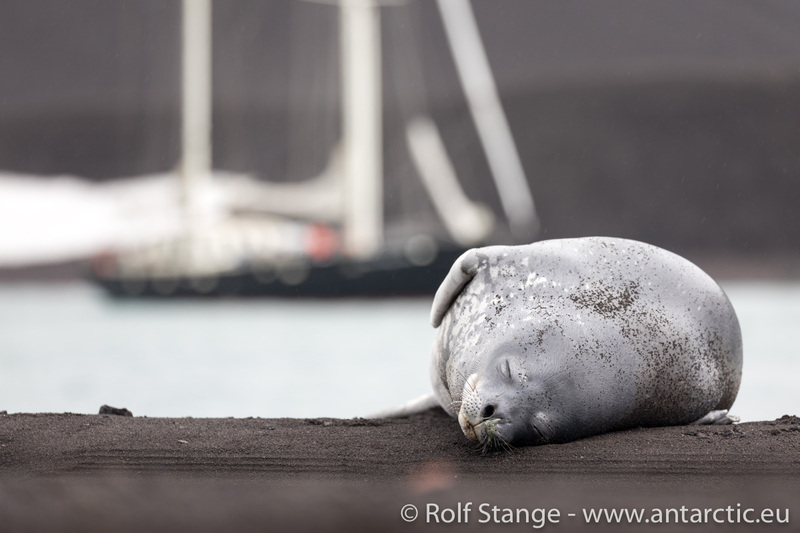 Daily life on the ship next to the watches is mostly sleep, half-sleep, reading, meals and conversation. Life at sea, which will last for 3-4 days altogether. 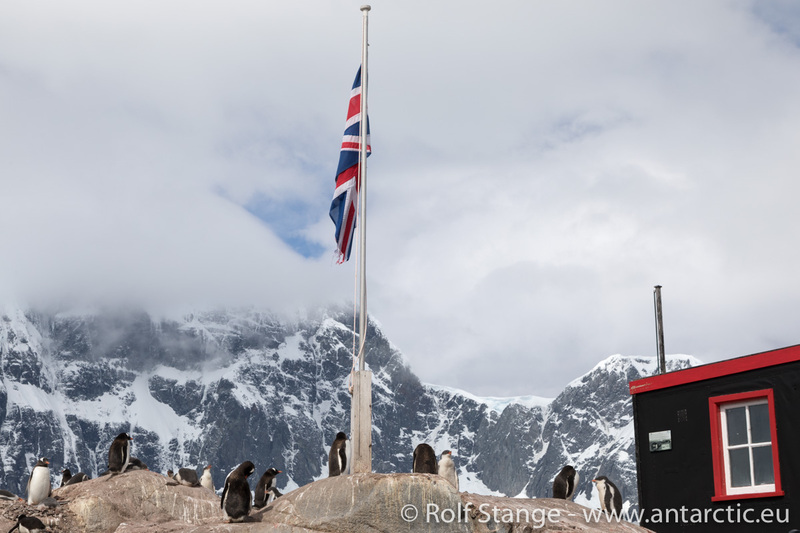 We expect to reach the South Shetland Islands on Sunday. 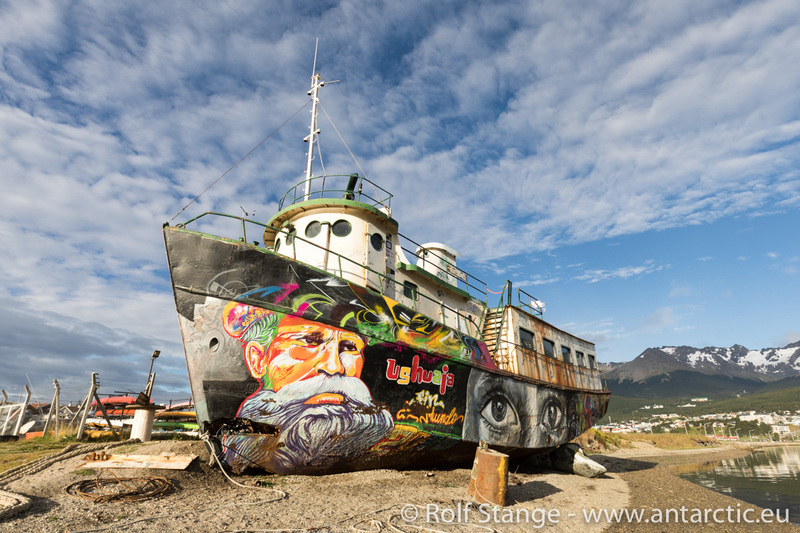 Everything is much more personal on such a small ship – including the offical part, so we went altogether after breakfast to the immigration authorities to say officially goodbye to Argentina. 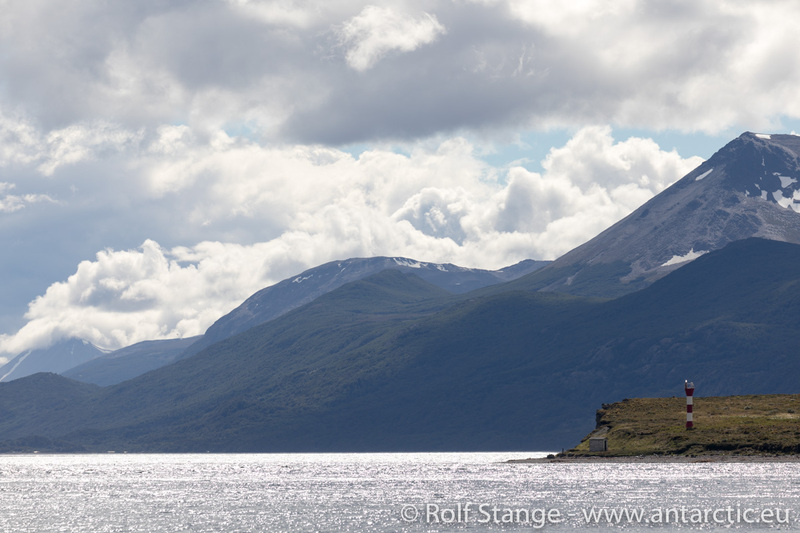 That did not take much time, and soon we could leave the little pier and turn into the Beagle Channel – an exciting moment! 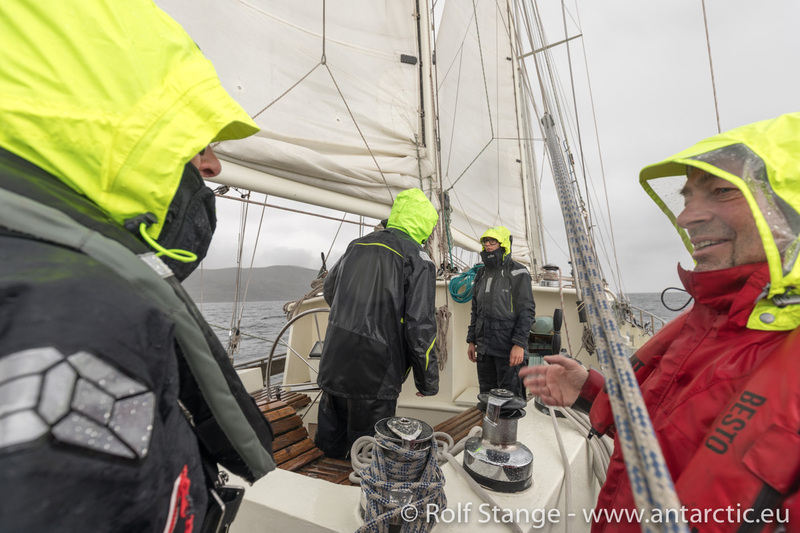 The weather kept changing by the minute from sun to rain and hail and back, but the wind kept coming from the east, so we could put sails up and use them additionally to the engine while we enjoyed the scenery slowly moving past. 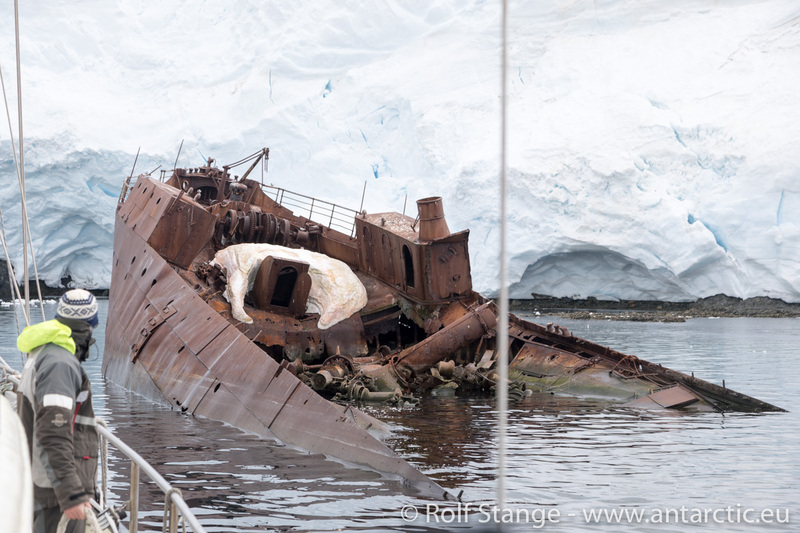 We had almost left the Beagle Channel when Heinz stopped the ship to get some maintainance done before we would be in open water – a little routine exchange of a part in the engine room. 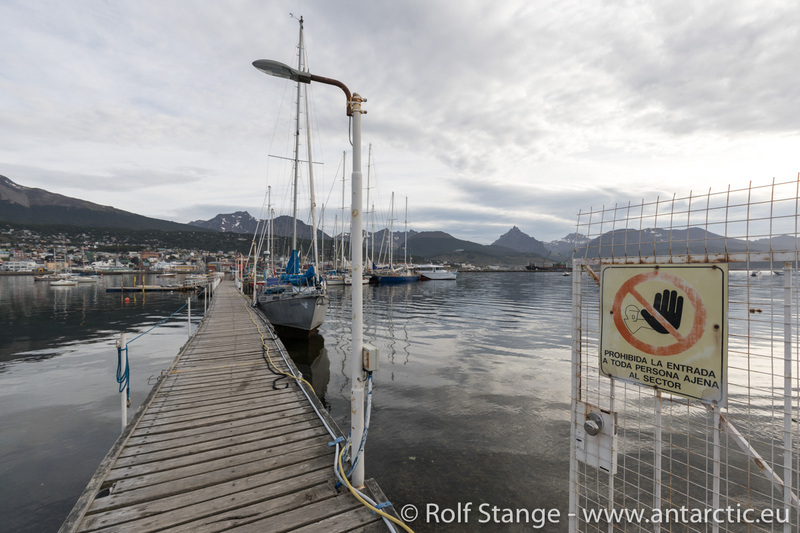 But it turned out to be a bit beyond everyday routine, because the spare part as it had been delivered to the ship in Ushuaia turned out be not the right one. 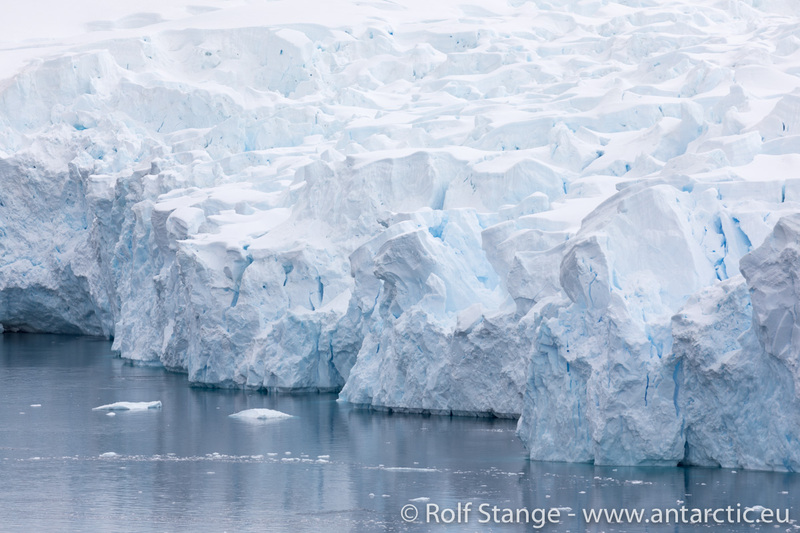 A difference of just one millimetre could be more than enough to screw things up, and so it was here. 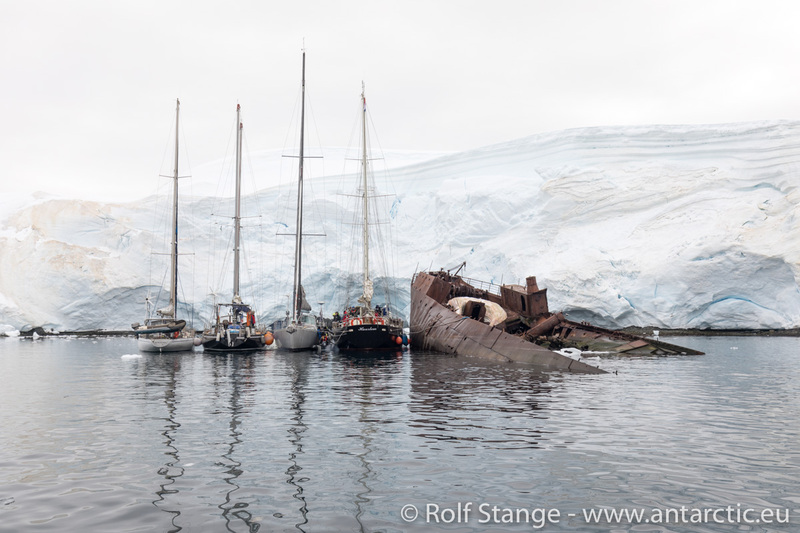 There was nothing else to do but to make a 180 degree turn and set course for Ushuaia – it was just not an option to sail to Antarctica without having the essential infrastructure of the ship 100% in good working order. Actually, we all agreed quickly that the risk of having our pasta uncooked for several weeks was not really an option. 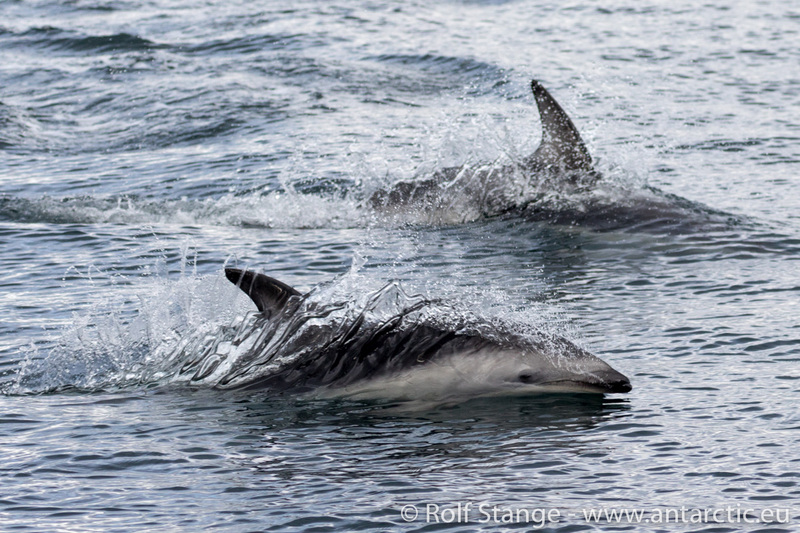 For those of us who were on evening watch, we got a lovely view in exchange when some dolphins came close to the boat and two of them jumped out of the water and turned in the air, perfectly synchronized! 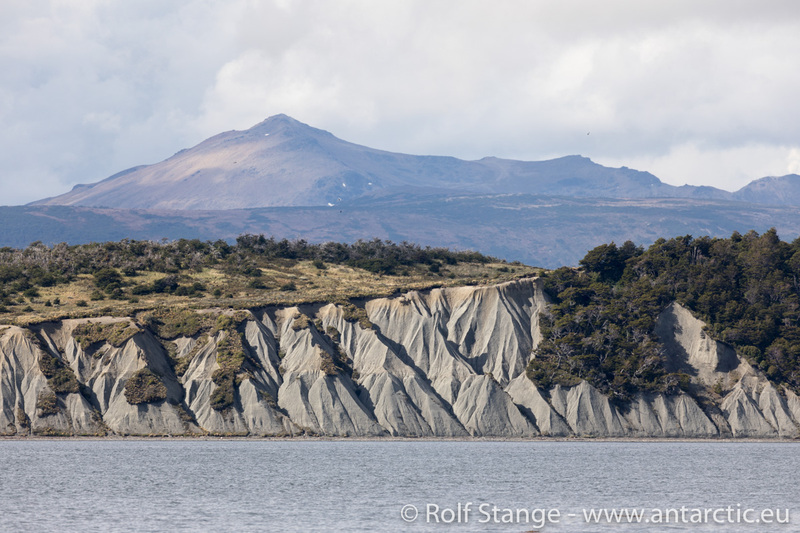 It is a long trip from central Europe to the southernmost tip of South America, from Frankfurt via Buenos Aires to Ushuaia. 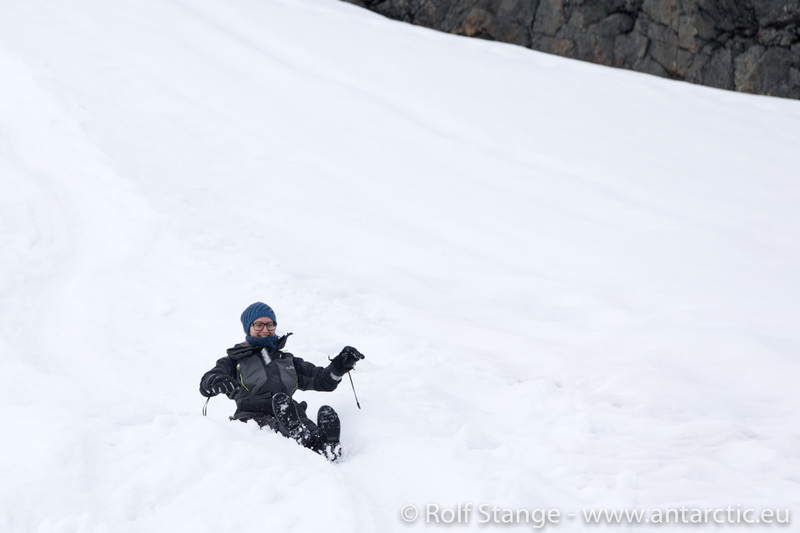 It is quite nice to get the body in a horizontal position after 38 hours in planes and airports. But this is just the unavoidable beginning of such a trip. 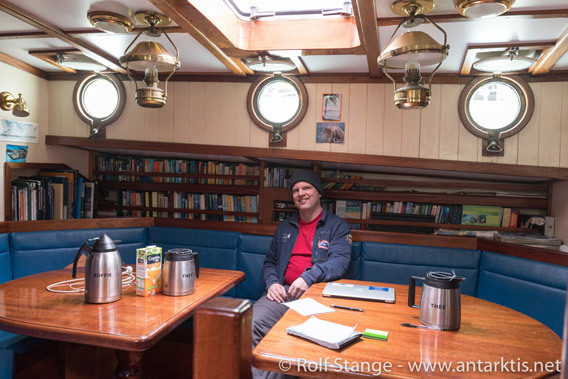 Now that’s already history, and I am sitting in the cosy salong of SY Anne-Margaretha, a 22 m long Dutch two-mast sailing boat with a solid steel hull. 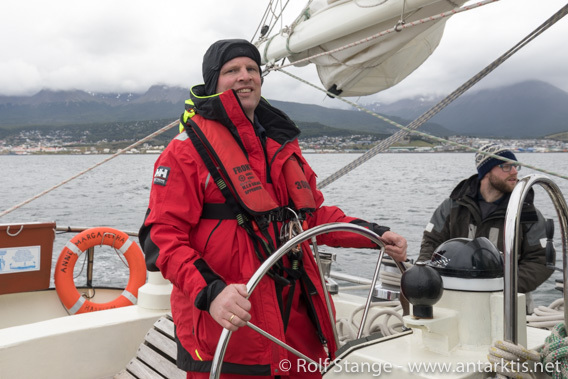 On this boat, skipper/boat owner Heinz Wutschke and his crew of 4 will take us down south to Antarctica in the next couple of days, over a total duration of 25 days from Ushuaia to Ushuaia. Serious stuff! Most of the bigger ships are back in port after 10-11 days. 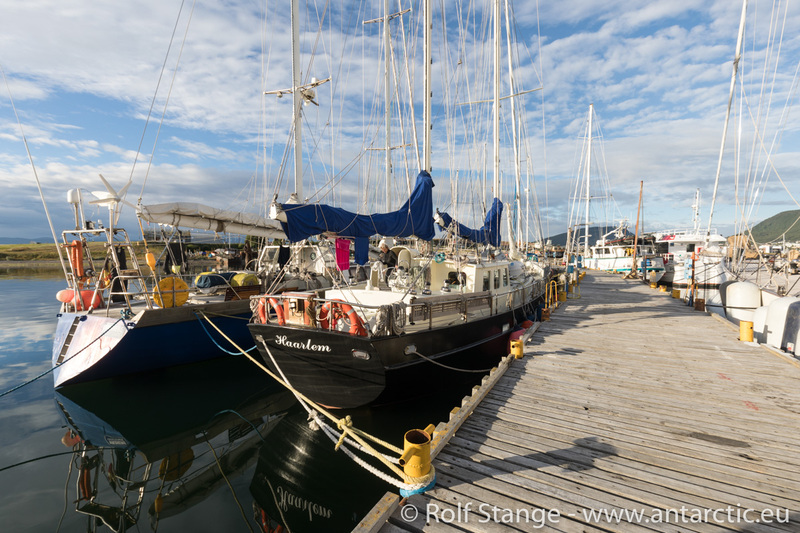 SY Anne-Margaretha (left) in the yacht harbour of Ushuaia. Heinz and is crew are still busy getting everything ready. 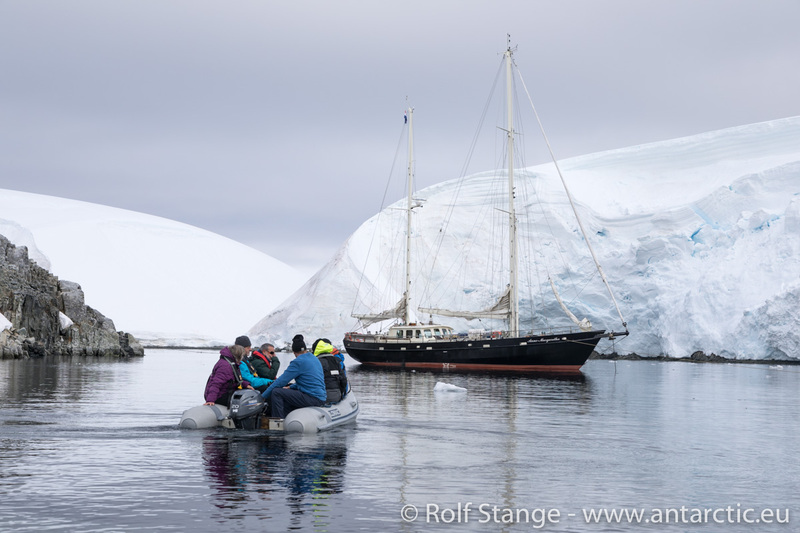 Our passengers are around, yesterday we already had the opportunity already to share a glass of whine and to bring out a toast to the voyage. May the winds be with us! 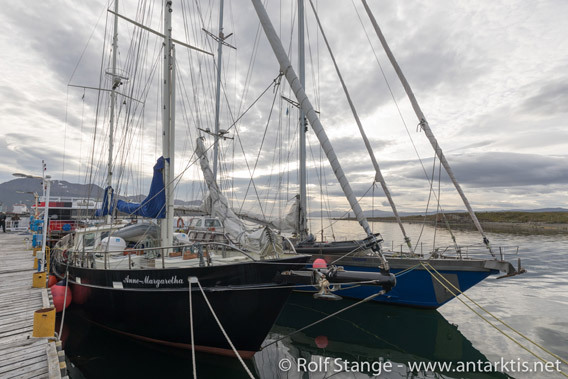 Rolf settling down on SY Anne-Margaretha in Ushuaia. They won’t if we leave today, we know that from the weather forecast. 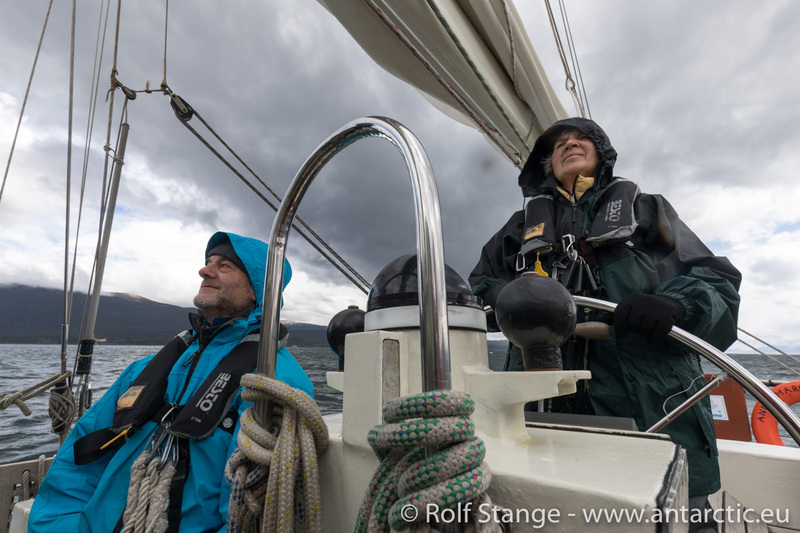 So we will take it with time and leave tomorrow, probably staying somewhere in the Beagle Channel and sail out into the Drake-Passage the day after tomorrow. 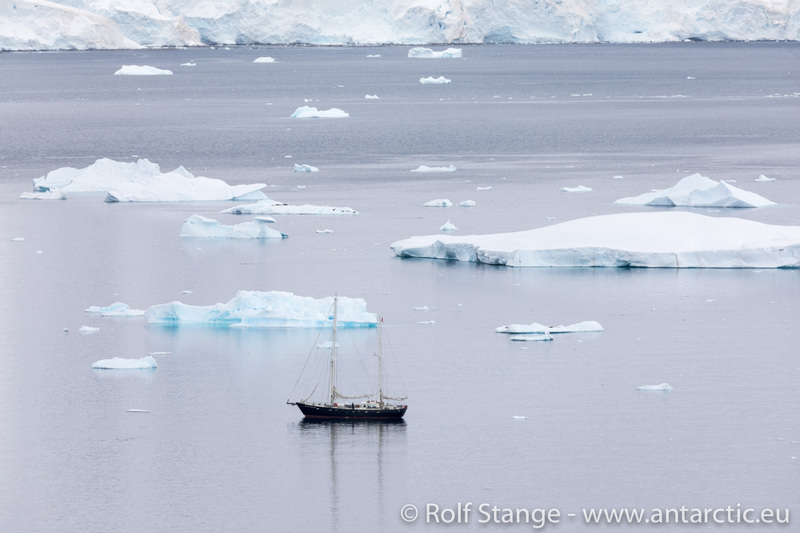 That way, we should have fine sailing winds all the way to the South Shetland Islands ☺ and that would help a lot. 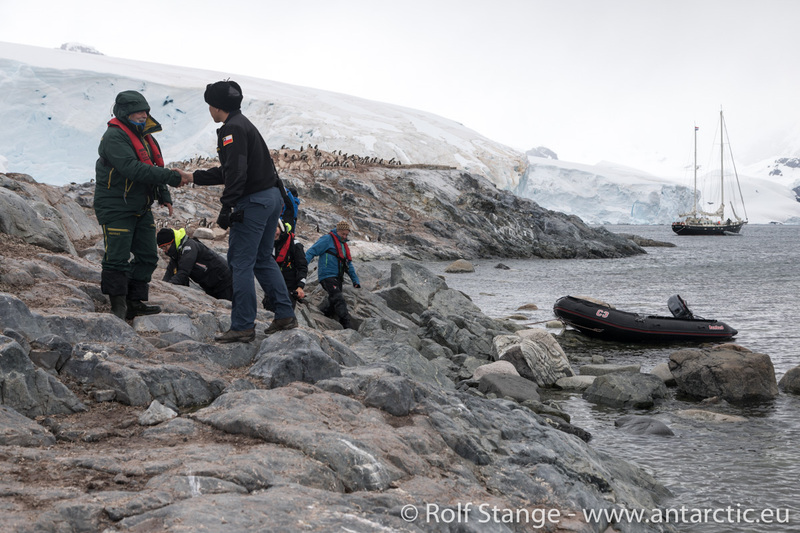 We all know that the Drake-Passage is a place to be treated respectfully, especially from the perspective of a 22 m boat. Fair winds will make our life during the crossing much better, that’s for sure. 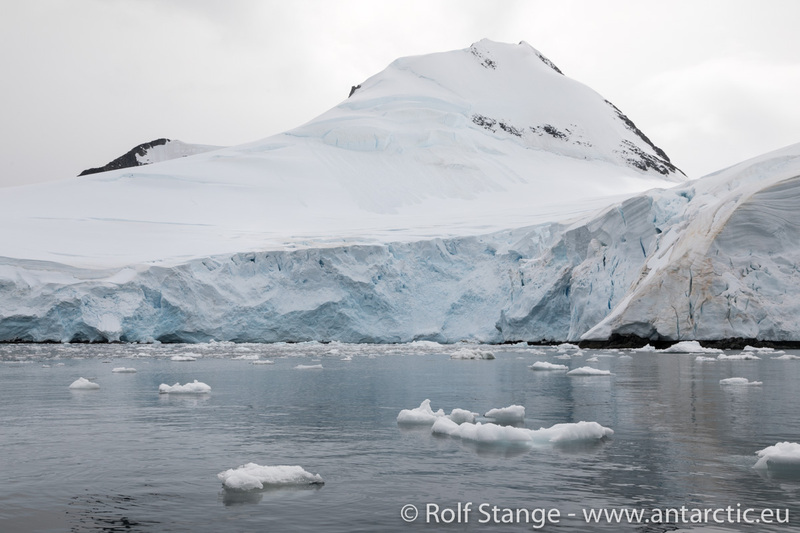 The Beagle Kanal: the first step of our trip to Antarctica! 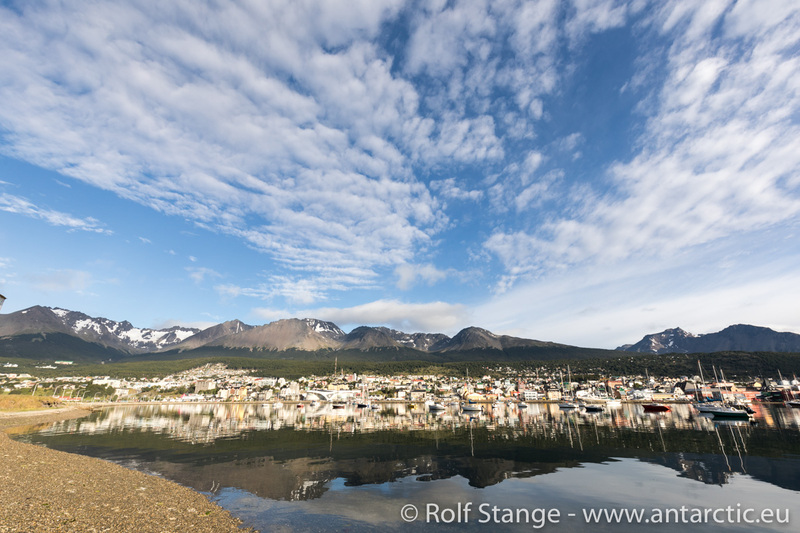 So, everybody is out, enjoying a warm and sunny day somewhere in the surroundings of Ushuaia, in the National Park or elsewhere, before we meet altogether for dinner on board. P.S. 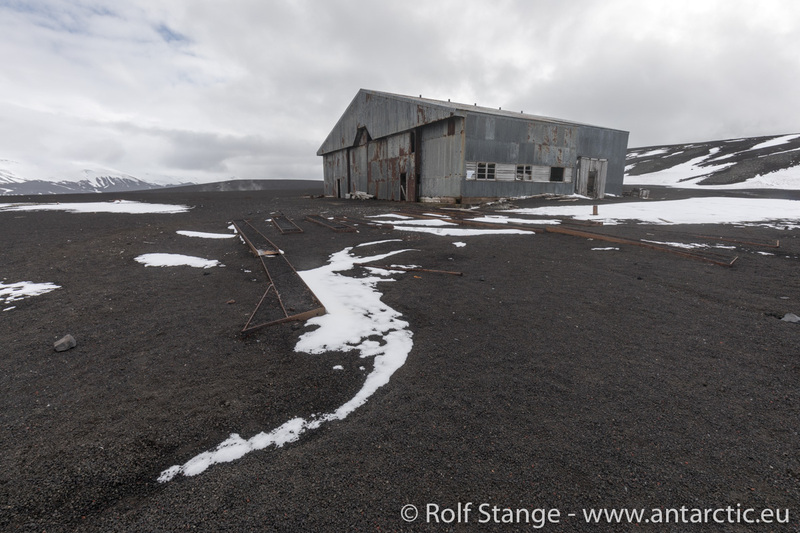 as usual, I will update this travel blog more or less regularly over the next couple of weeks. 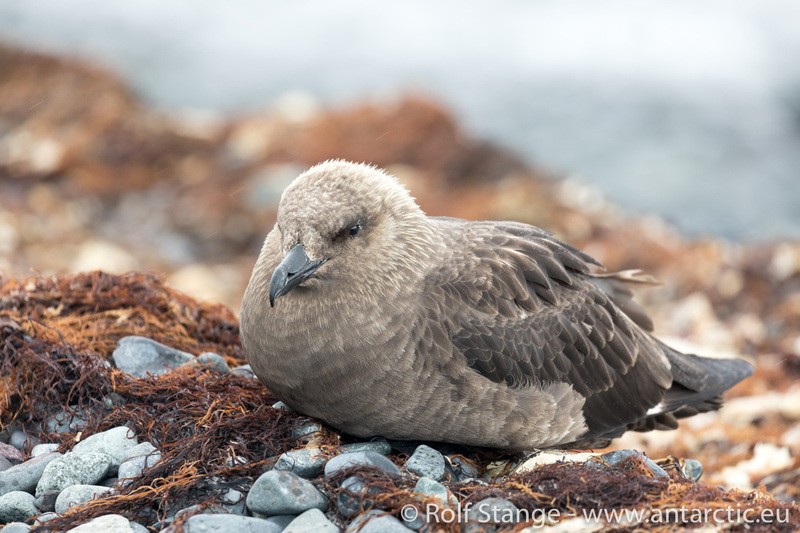 That depends on time and the possibility to sit down on deck and establish a satellite connection, so it will certainly not happen in the Drake Passage and during periods of bad weather. Nevertheless, I’ll find opportunities every now and then, so please keep coming back! 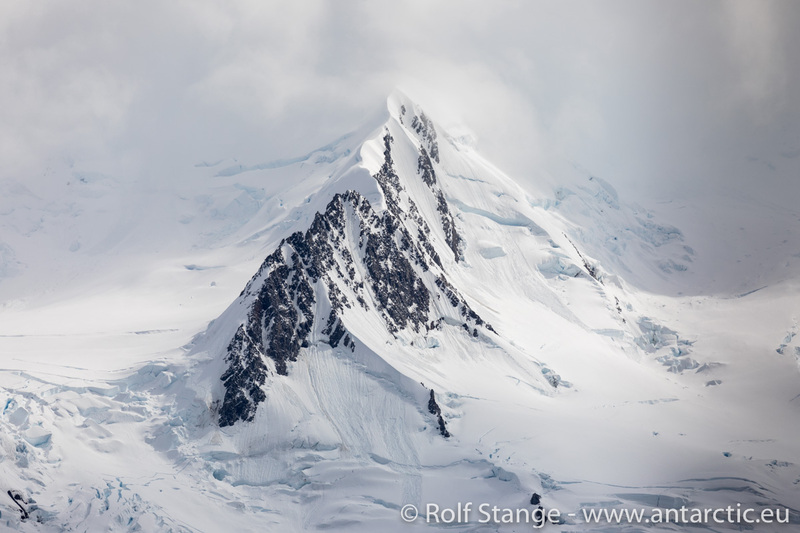 And when back in civilisation around mid February, I will replace the few and small pics that I am able to send through the satellite by much nicer photo galleries. So, again, it’ll be worth coming back to this site then! 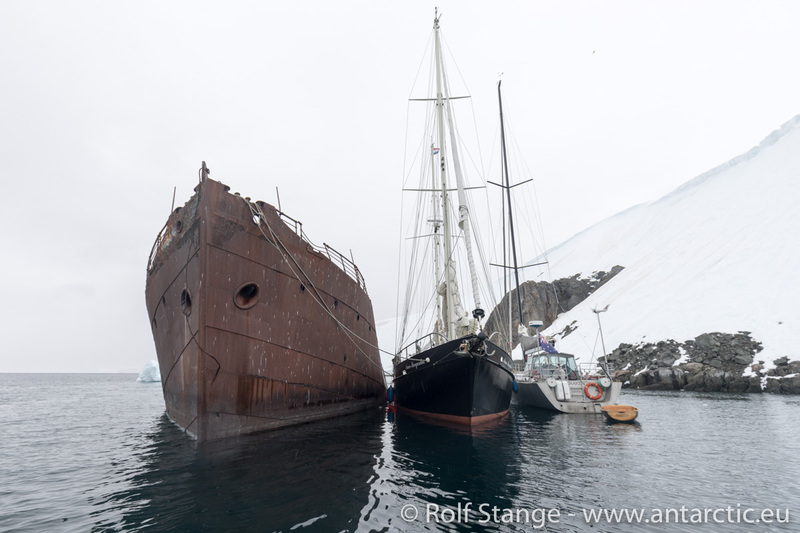 There is a blog for our current voyage to Antarctica with the two-mast sailing ship SY Anne-Margaretha. 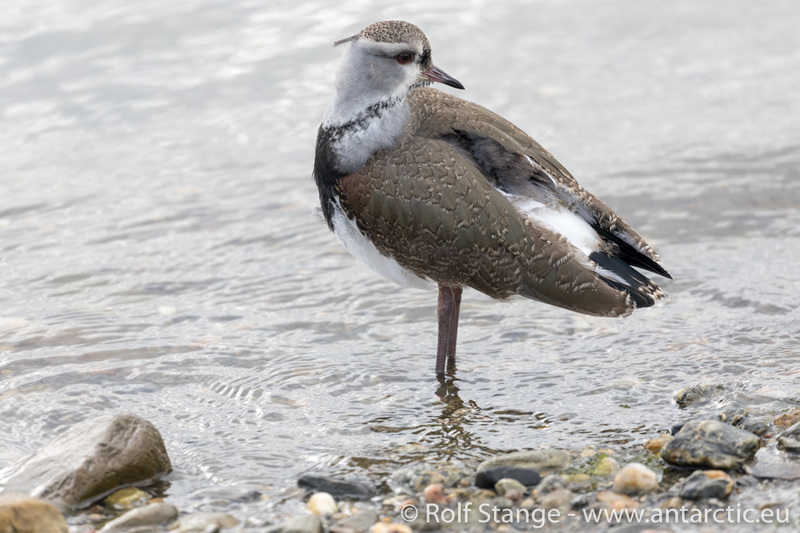 Please click here to visit the blog! 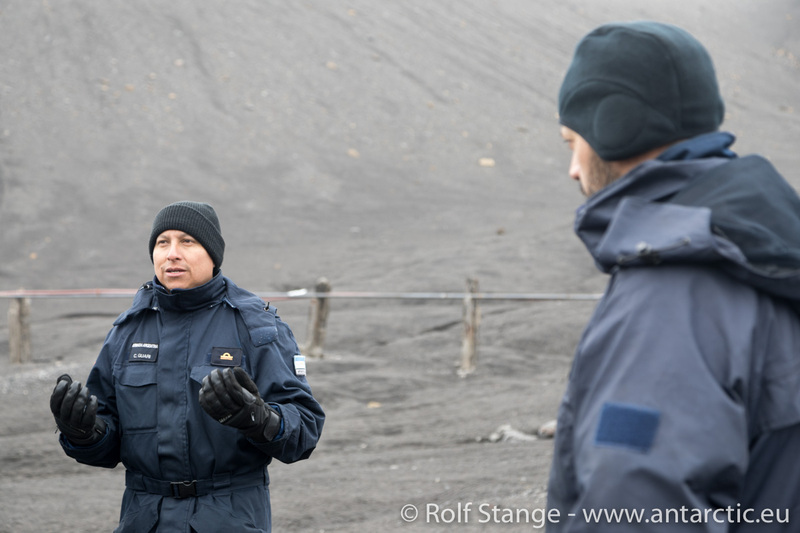 Reports will start in the next few days and will be transmitted via satellite to the webmaster (so the technology works) and published by him and linked in Facebook the next day.